Oscar is such a handsome, intelligent gentleman! 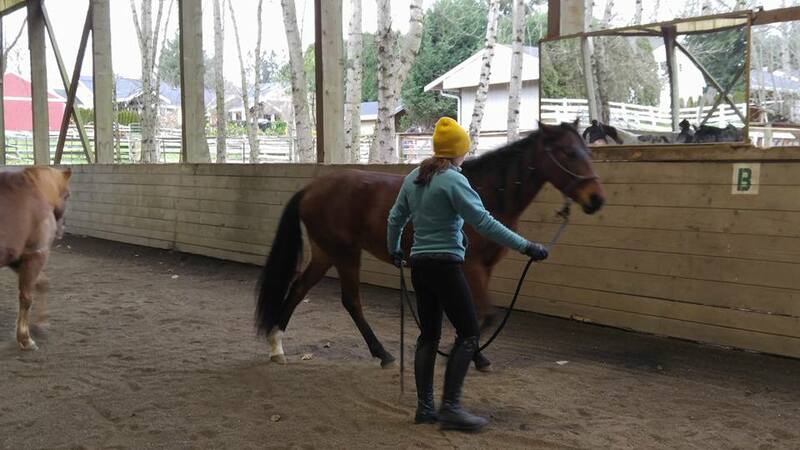 He is currently being ridden English (though also goes Western) and is a lovely, smooth mover at all three gaits. 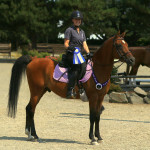 Oscar has plenty of show experience and has won many ribbons at local shows. 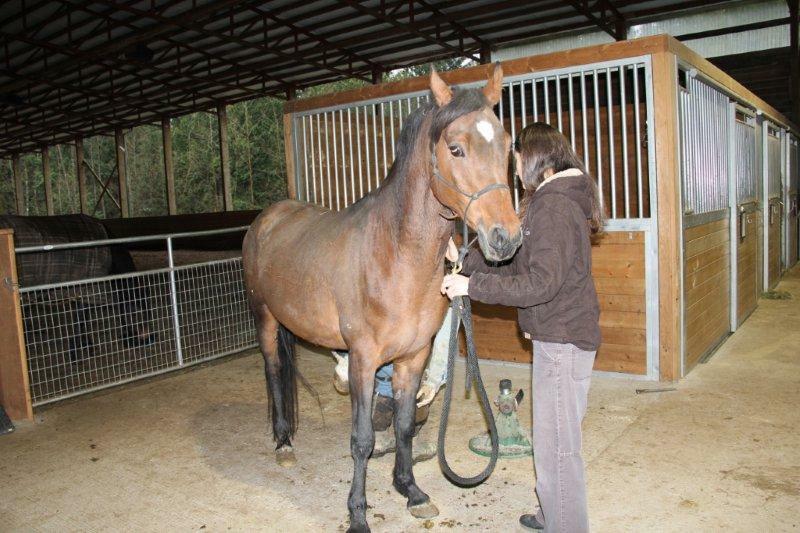 He stands well for the vet and farrier, and trailers with no problem. 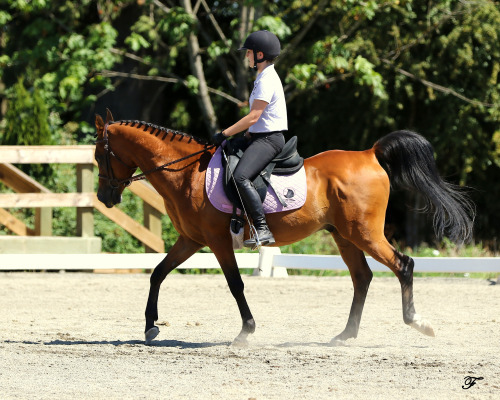 Oscar is not suitable for jumping, but would be an excellent fit for an adult intermediate, smaller‐framed rider interested in building a great flatwork partnership. 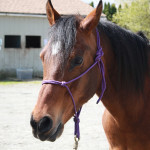 Oscar is available for adoption to an advanced beginner (under supervision of a trainer), or an intermediate rider. 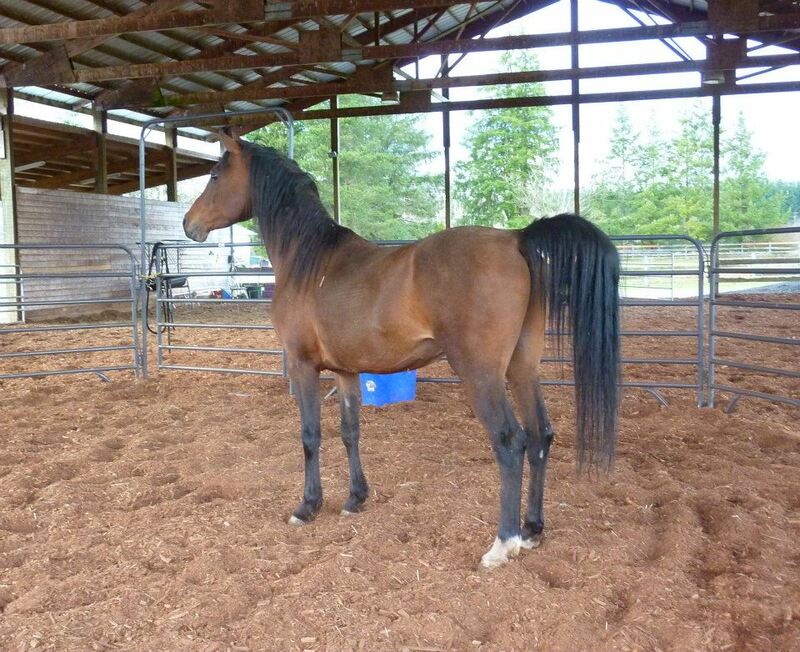 His adopter should plan to keep him in work at least 4 days/week and be willing/able to engage a trainer to help, if necessary. 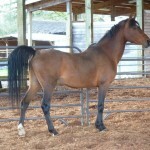 When he is handled and in work regularly, he is gentle enough for beginners to groom and ride under supervision. 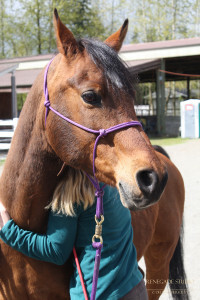 He’s very sweet and LOVES human interaction! 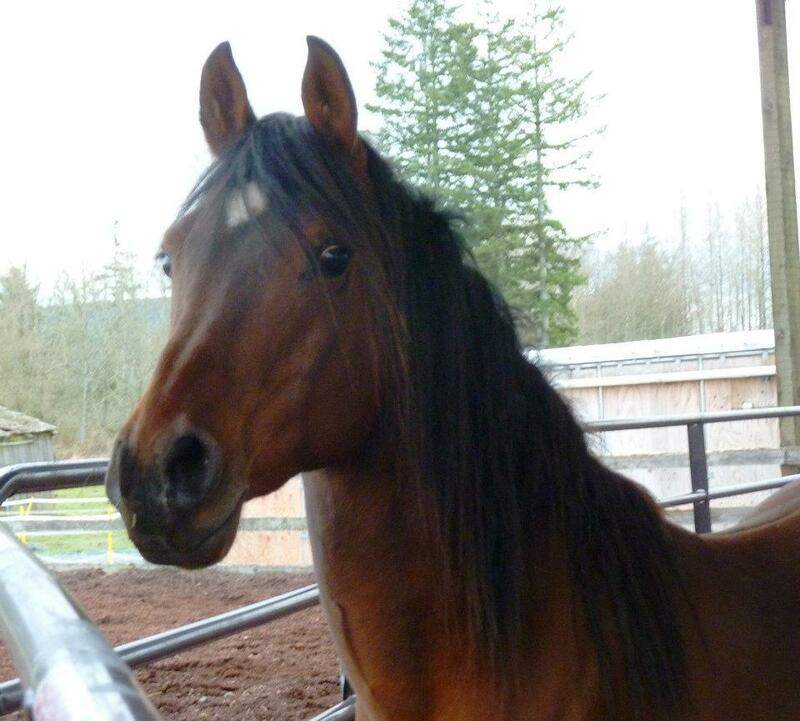 It is with great happiness that we announce the adoption of SAFE horse Oscar! He has spent the last month getting used to his new life and proving to be the best boy ever! 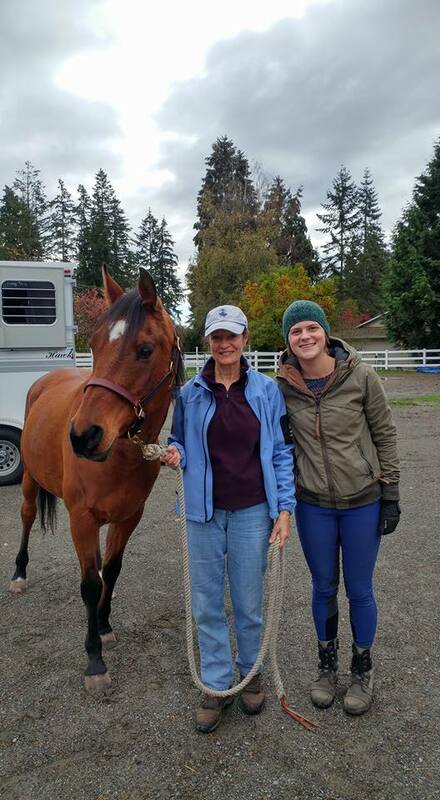 Oscar joins his new owner Vickie C and her family on their lovely farm in Redmond. 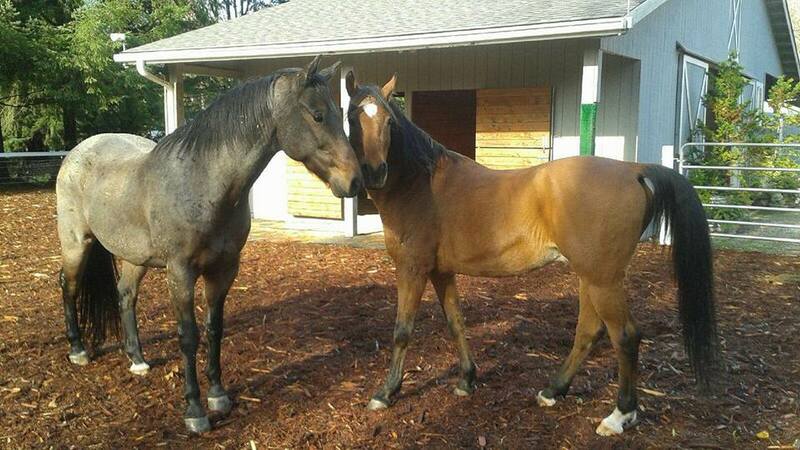 He has fit in nicely as the big brother to Vickie’s younger horse named Hank. The two boys are doing well together and have figured out how to live together in peace and harmony. Vickie reports that Oscar is “a really good boy. Very sweet!” The two geldings have gotten used to the routine and have started playing more together. 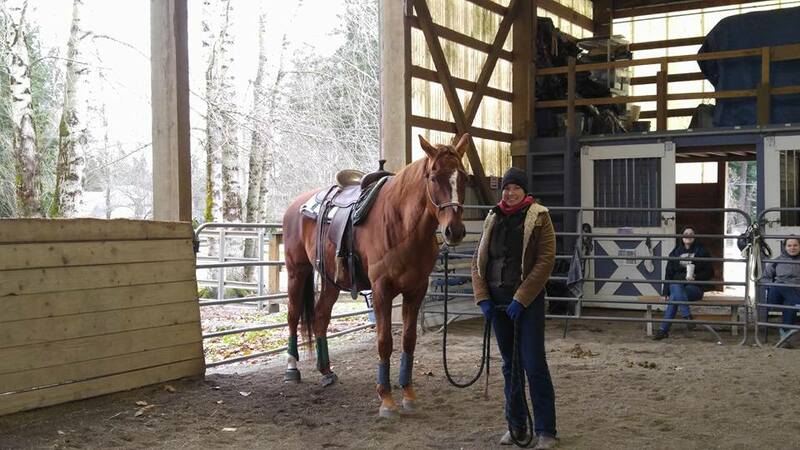 Oscar even does well when Vickie takes Hank to the neighbor’s riding arena. He calls just a few times when they leave but is content while they are gone. This was an important part to making sure this would be a good home for Oscar. 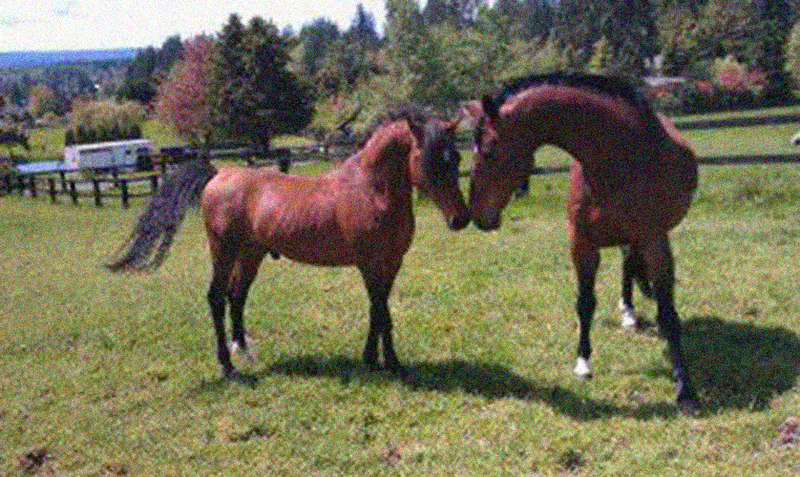 Not a lot of horses can deal with their pasture mate’s absence so the fact that Oscar is handling this is great news! 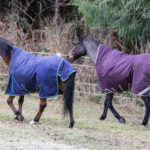 Buddies for a walk in their big pasture! 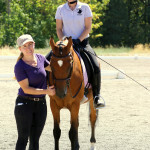 Oscar and his friend and volunteer rider Lindsay. Going to miss this sweet boy! Oscar supervises Hawk’s cleaning job. 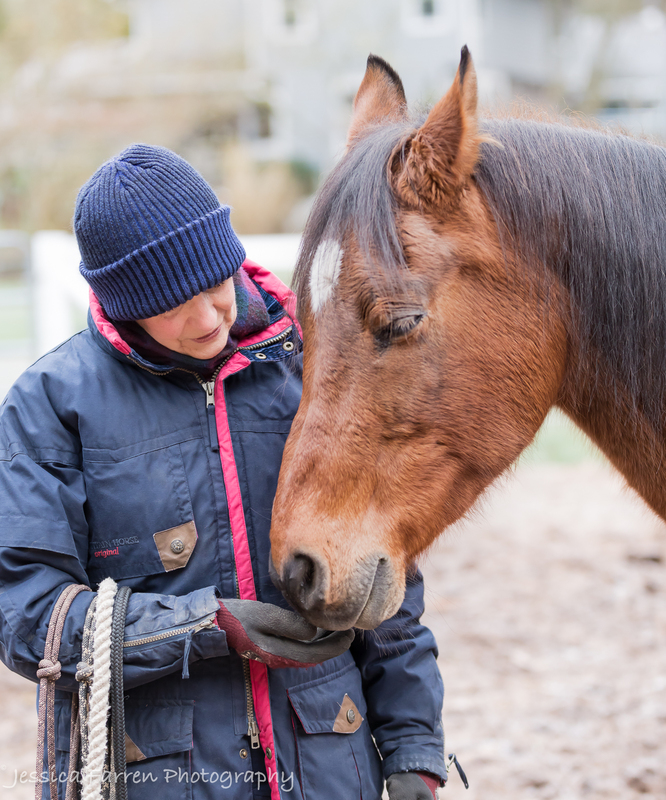 Oscar has been a superstar for many of our volunteer riders. 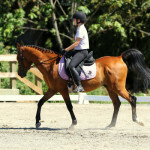 He continues to do well as a riding horse and has great ground manners. 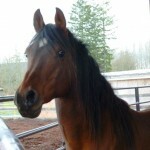 We love him very much and hope that his forever family comes to find him soon! 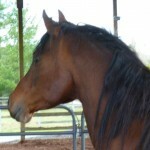 He is a gentleman and a volunteer favorite. He deserves a loving family to call his own. 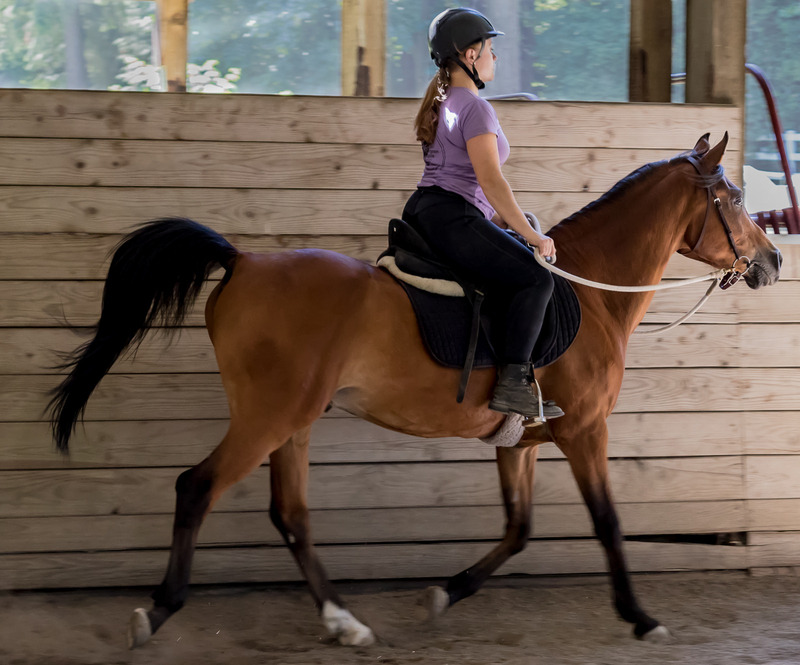 Here are some handsome new photos of Oscar and volunteer rider Erika. 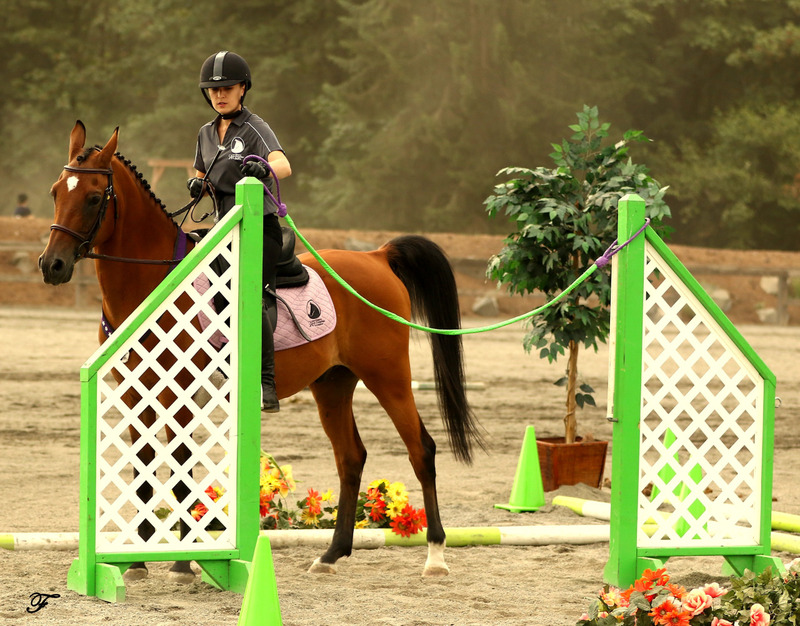 SEE OSCAR IN ACTION at the 2016 SAFE Benefit Horse Show, July 30–31, 2016, at Meadow Wood Equestrian Center in Snohomish. Click here for details about the show! I am taking a ‘less is more’ approach with Nala and Oscar, in hopes that more frequent short sessions will build trust and support them to make small changes over time. It’s a layer of the onion thing again! My intention is to support their bodies to be in balance physically and mentally/emotionally so that the wisdom of their bodies can process and heal as needed over time. 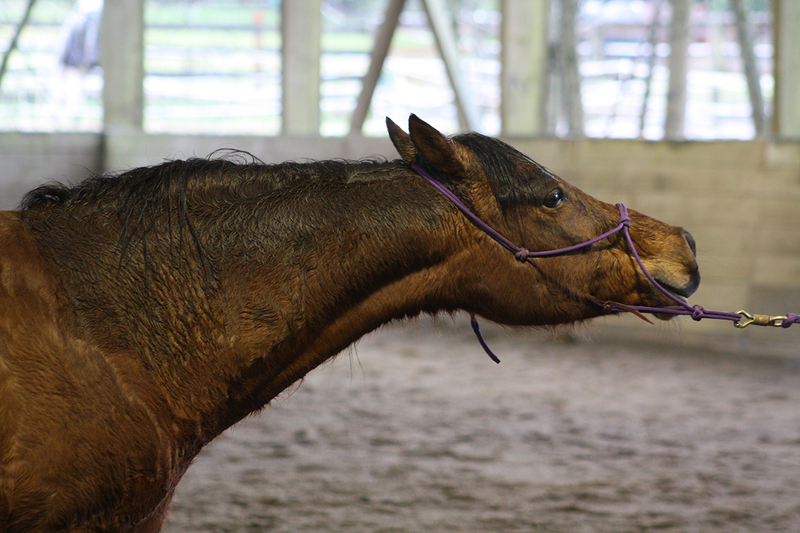 Nala 5/3/2016– I started with Nala in the turnout, and then she asked to go back to her stall. Perhaps she knew it was near feeding time. Note to self: work with Nala when it is not mealtime. I also noticed how interested she was in the kids visiting yesterday. Seems that she likes them. Similar to last time, she walked away from me to process and came back when ready for more. This time she spent a long time processing. I honored that, kept checking in with her. Her eyes were blinking, nose/lips quivering, and periodically, she’d lick and chew. At some point I went out and stood a couple feet from her shoulder to support her. Then her head lowered below her withers – another good sign of processing, and that her body was releasing its own endorphins. When I invited her spine and pelvis to move more and the circulation increases, the hair over her spine started to shine. 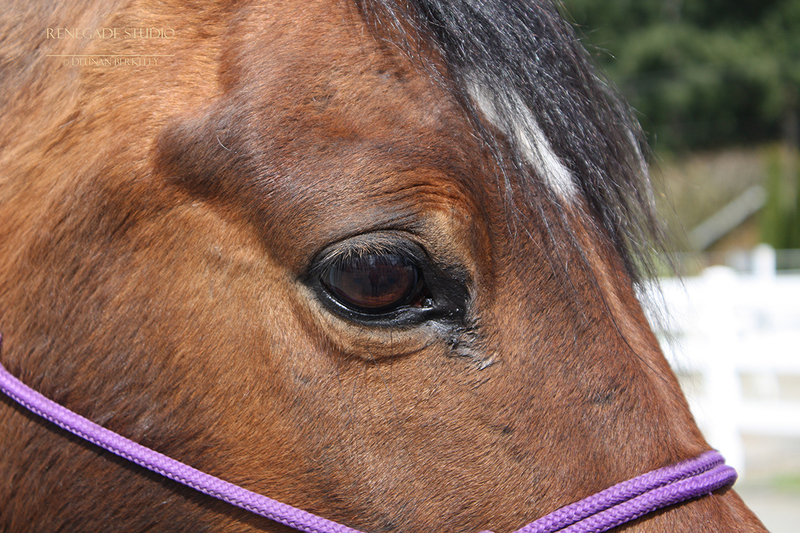 She continues to feel guarded emotionally, but her body is cooperating with this work if I go slow enough. I’m pleased with her engagement with the work and processing it. When it was feeding time she was totally focused on that and acted worried about getting hers. Nala 5/20/2016‐ Nala was busy eating lunch in her stall, and I let her continue to eat while I worked. I was able to do more deep work with her this time, as well as the vibration technique with her front legs. 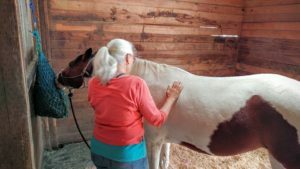 She was quite clear that she did not want me touching her back legs – even her gaskins. I wonder if her issues in front are compensations for something behind or in her back. I did most of a structural integration session with her. She allowed me to work deep in her shoulder on the left. I found a tight muscle along her back right above the shelf of her ribs on the left; it was similarly tight but less so on the right. It felt like the iliocostal muscle which runs alongside the longissimus dorsi muscle. 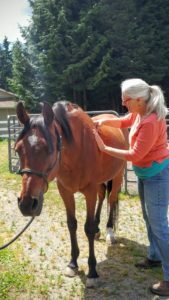 Nala 6/10/2016– Nala loved the structural integration neck and shoulder work on her left side (it can support healing on the other side of the body). She also loved work on her inner left leg, and cocked her hip for me, which allowed deeper access to the tissue. Nala needs pauses to process during her sessions. 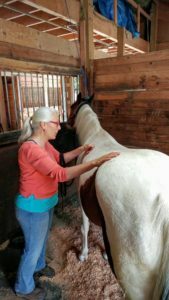 These pauses involved my hands on her and me feeling lots of tingling as she received Reiki. 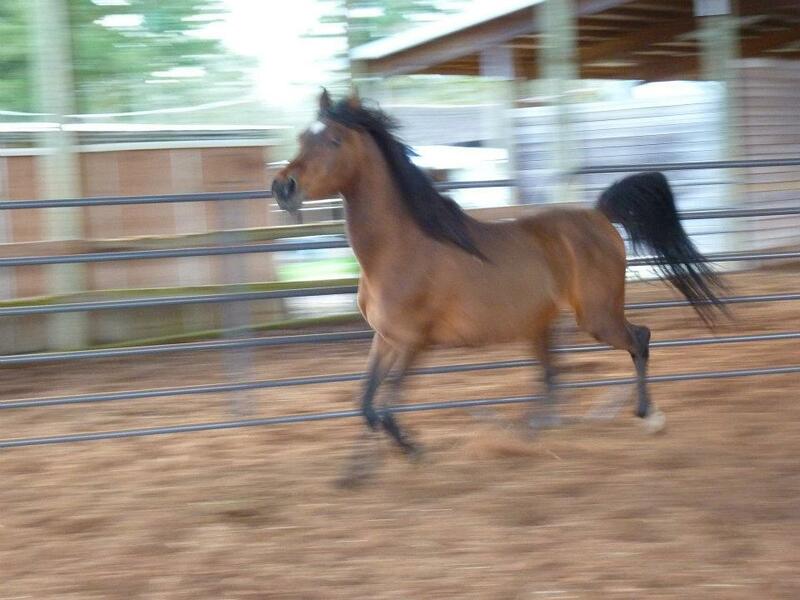 She reacted to some strokes across her barrel. I paused between sides to write some notes. 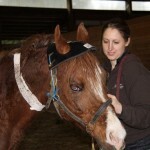 On her right side we did lots of Reiki, and she was wigglier, not wanting me to touch her. 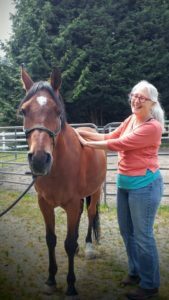 She kept processing and getting offered Reiki and other options like lifting her back. Finally she was done without my doing much structural integration work with her right side, also didn’t do much vibration with her front legs. Oscar 5/3/2016‐ Oscar was more interested in connecting with me this time. I worked with him using Tui‐na and some light structural integration strokes (shoulder, long back muscle, loin and top of HQ). 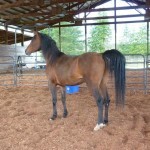 Encouraging long back muscle to soften and move (his is pretty good) and encourage movement along his spine and pelvis. 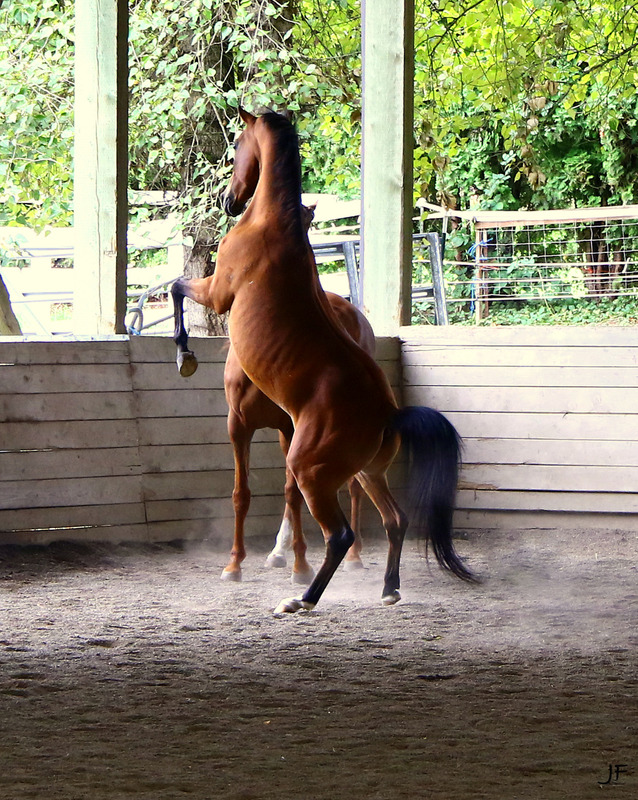 (disclaimer: not chiro, bodywork) Oscar looks good from lots of perspectives, but I’d like to see more movement in his pelvis and spine. 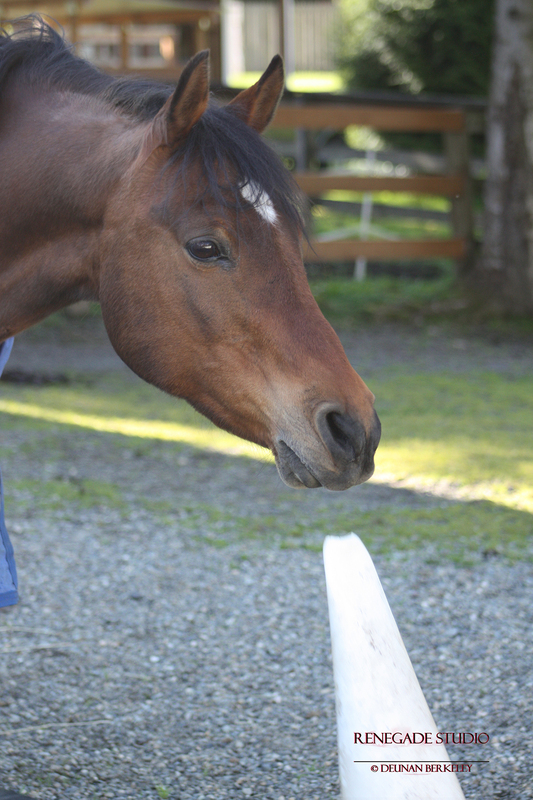 He did some good processing, and stopped eating when I came into his space. Will be curious to see how he is next time. 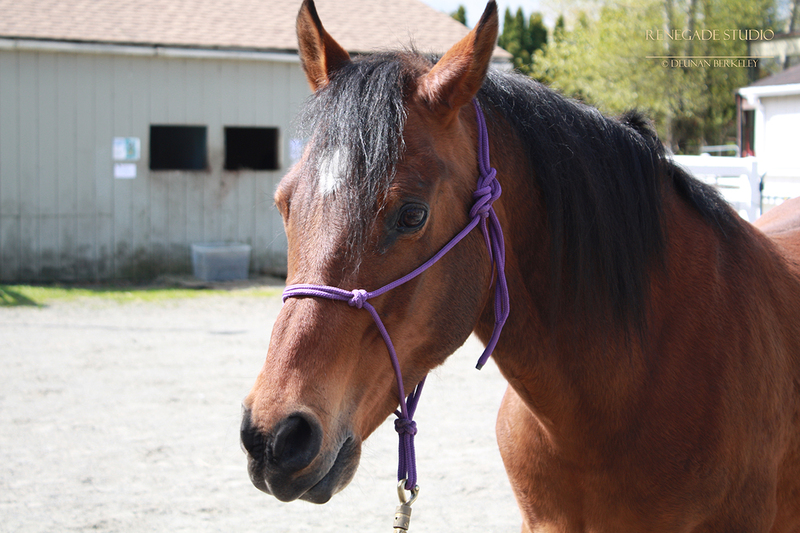 Oscar 5/20/2016– I worked with Oscar in the turnout area above/behind the arena. 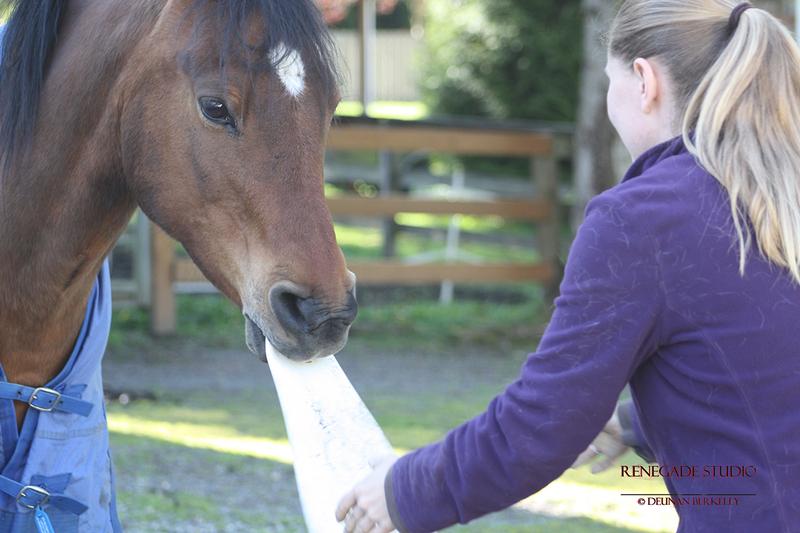 He enjoyed the Reiki I offered him more than the percussive strokes. He really relaxed and received it. 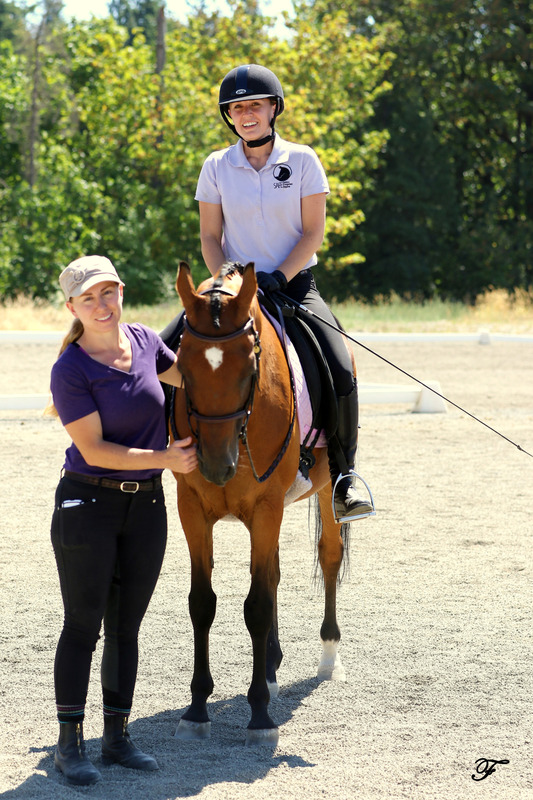 When I explored deep tissue strokes, he allowed some really good work on his left side – cocked his hip to allow me to work in a relaxed muscle, also around his neck and shoulder. 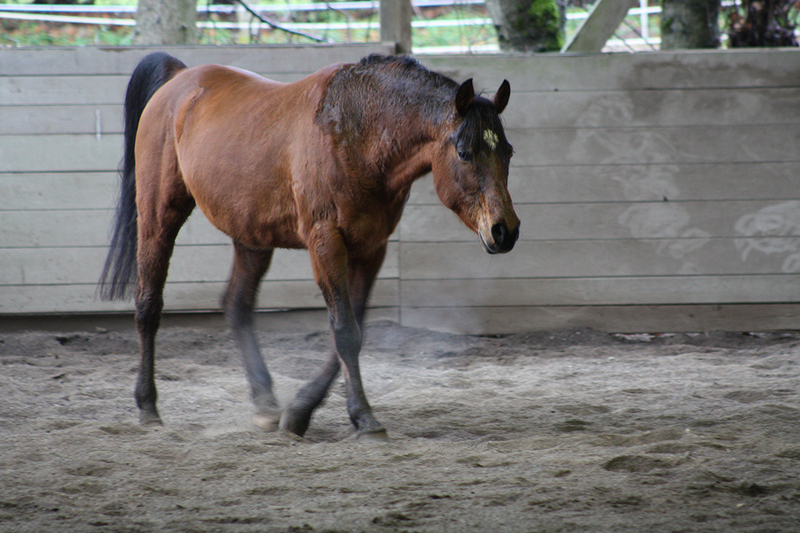 On his right side, he was either done or protecting, but did allow me to work around his loin, top of his hindquarters and down his hamstrings. 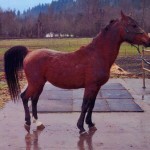 The muscles in the top of his right hindquarters felt pretty lumpy to me. I’ll explore that a bit more next time. Oscar stayed very connected with me during most of the session. He followed me around, licked my hands, and had many good releases throughout. 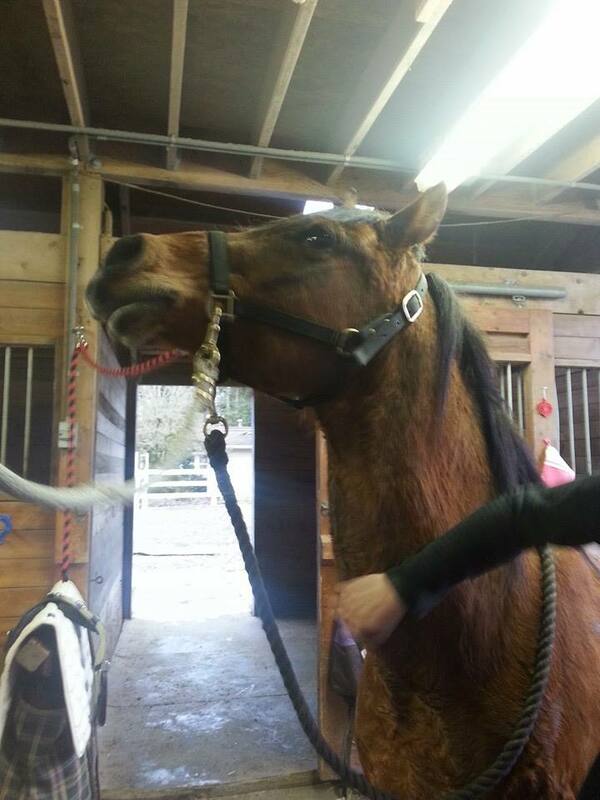 I did notice that his mouth got tighter when I began the deeper (structural integration) strokes. 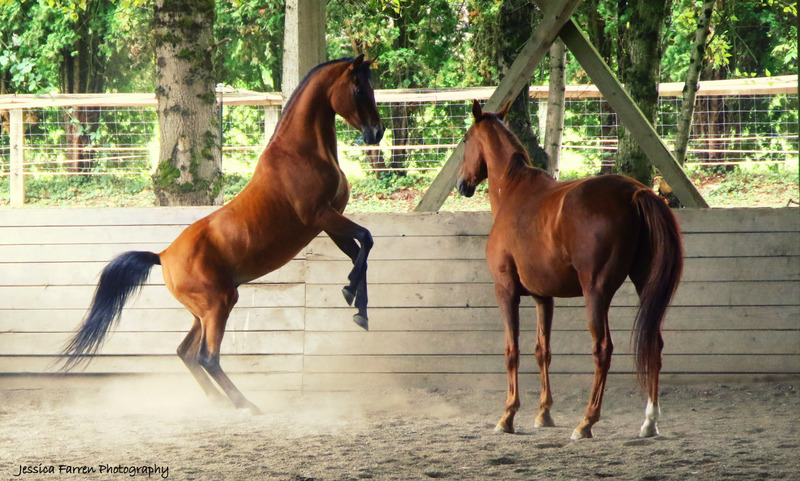 Knowing Arabs are sensitive and quick, I was aiming for lighter strokes, shorter duration, etc. He is such a sweet guy! Oscar 6/10/2016– Oscar’s session was mostly structural integration strokes, lasted about 45 minutes. 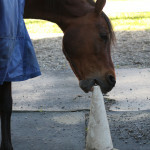 He had great releases, lots of licking and chewing, sighs, lowering his head, softening his eyes. 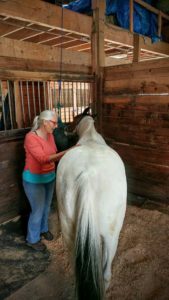 I started on his left side (the harder side), getting reaction from him just behind his shoulder and on top of his hindquarters. Both times, I paused, lightened up, and let the spots clear so I could complete the strokes. On the right side, he curved his neck around which gave me lots of access into the depths of his neck crease. He reacted to something in the right pectorals in front and inside the leg. Again, I paused and held my hand over the area without pressure or movement. This time it was an emotional clearing. As I cried, and said to him over and over, “I’m so sorry,” over and over. 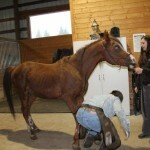 Then, “You are precious.” He just loved the work on the inside of his hind legs on both sides. 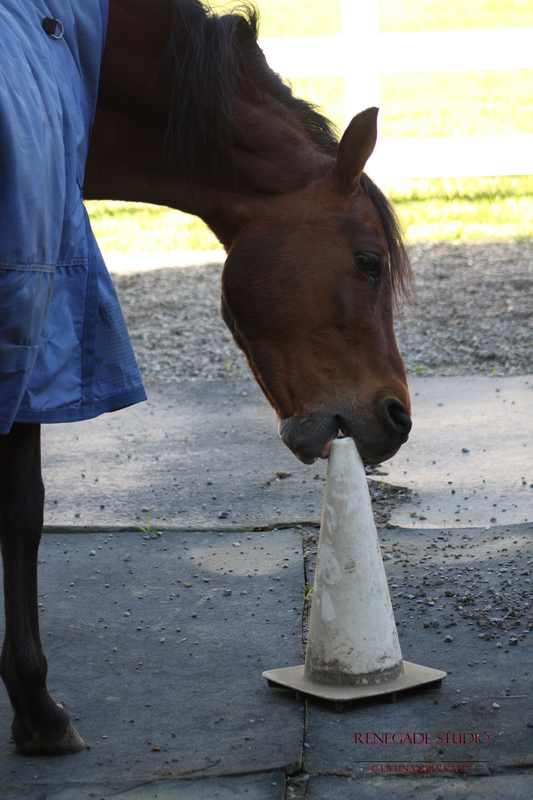 I completed all the strokes on both sides in that protocol, and when he was done, he was definitely done, telling me again with his ears and mouth. I’m always thrilled when the mental/emotional things stored in the tissue can emerge and heal. Good boy, Oscar!! I’m really pleased to be working with these two and am grateful for the opportunity. 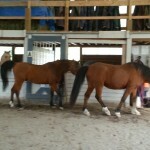 I enjoy coming to SAFE, and feel that Oscar and Nala are progressing in their acceptance of the work I’m offering them. It is important to me, and I think to any horse, especially rescued horses with unknown hurts and traumas, that each horse has a choice about bodywork. I let them know that I heard them when they move an ear, flick their tail, pick up a foot, etc. This helps create trust and supports them staying in the place of rest and digest where healing and learning happens. 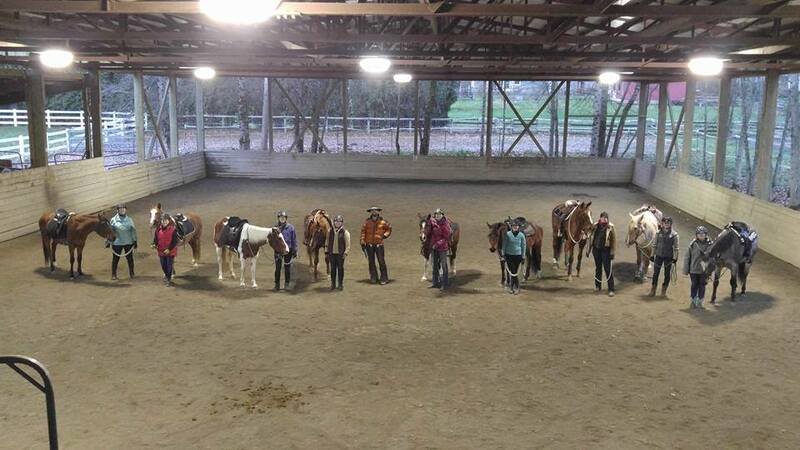 Great group of Volunteer Riders! 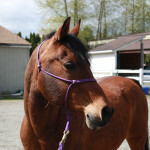 Jolene D:Khianna- At the time of the clinic Khianna had a total of 4 or 5 rides on her since her return from foster. She was nervous, but did so well! She tries so hard. She is coming along nicely and I believe will develop into an incredible partner for someone. 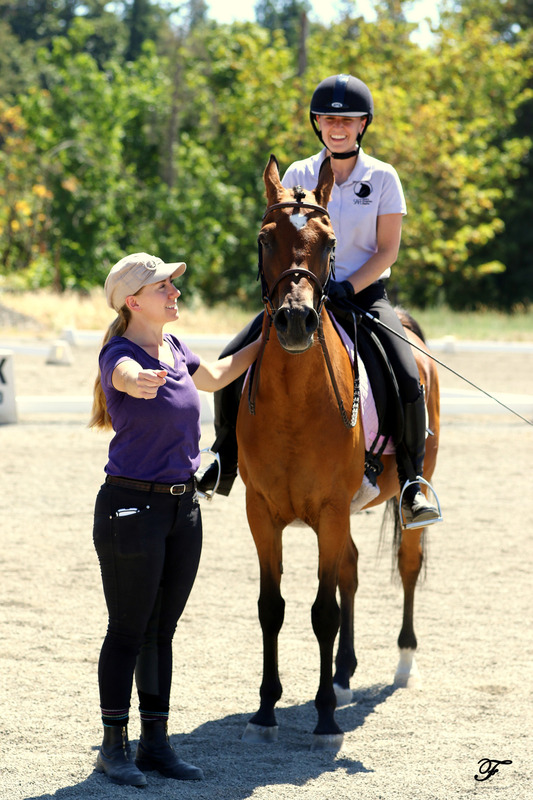 Sara E: Jewel — Jewel was an all‐star for the clinic, Claire has done such a great job with her. She felt flawless going from hind‐end to front‐end turns. 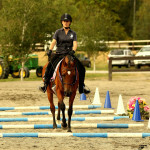 I learned so much while riding her during the clinic. 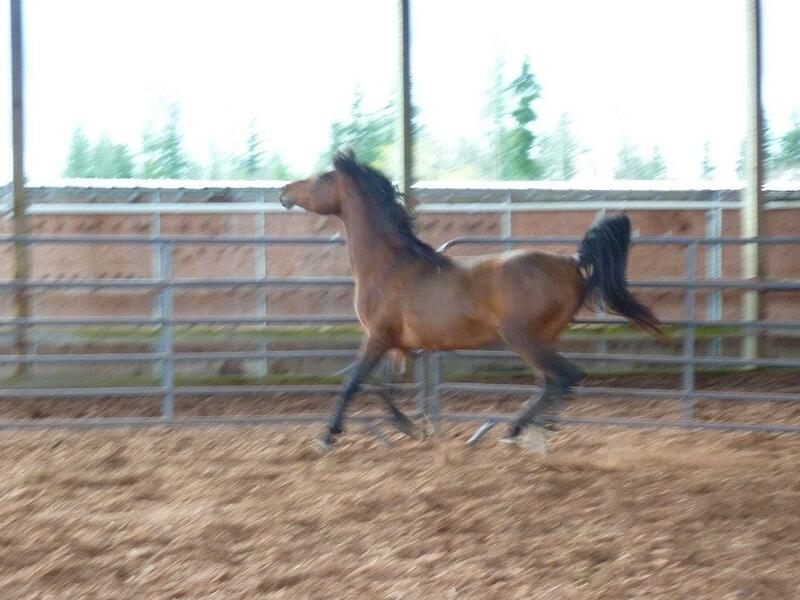 She is going to make someone a really great horse. 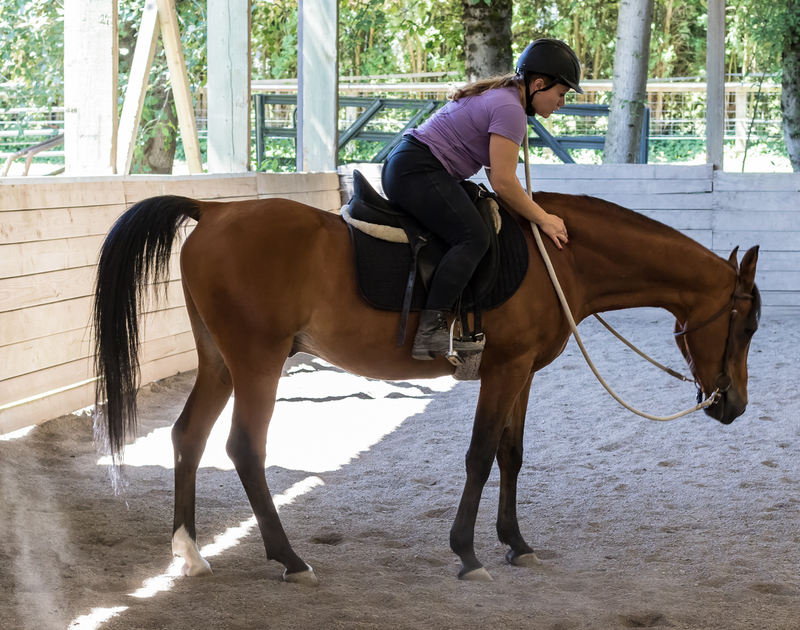 Sara E: Khianna — Did ground work with Khianna and at the beginning she was a nervous trotting mess, but Joel came over and helped me get her front feet moving and she calmed right down. She is so loving and tries so hard. Once she figures out you aren’t going to eat her, she just wants to please you and be loved on, I don’t know if I have ever worked with a horse that tries to give you 150% all the time. 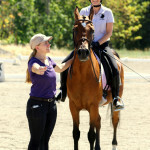 Lisa G: Ben- I can’t say enough about how the horsemanship that Joel has helped bring to SAFE amazes me. 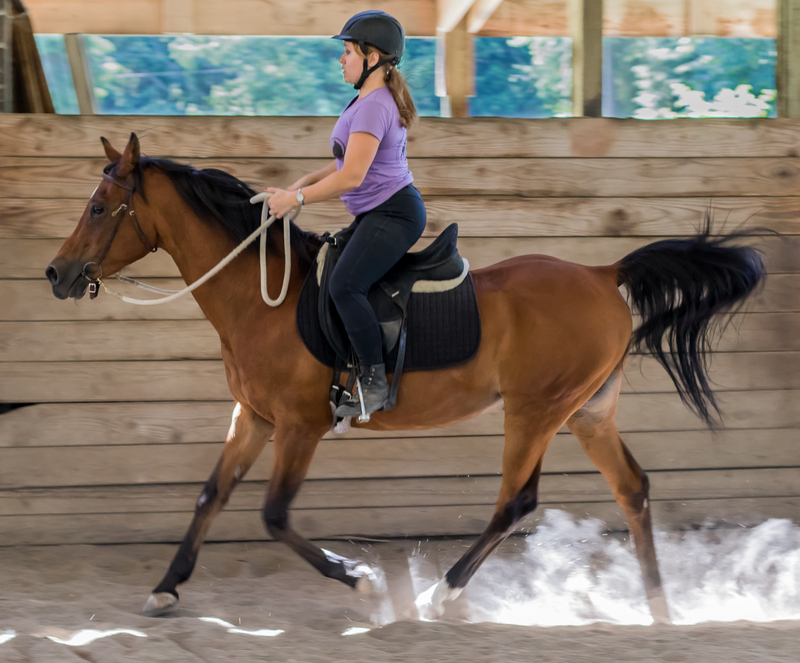 I had Ben in all 4 sessions, GW and riding, and I was honestly just hoping I could get him to stay focused on me with all of the excitement, maybe get some nice serpentines down in the riding portion, and work on soft feel and stopping/moving forward off of the seat. Well.…. He did all of those things and SO MUCH MORE. Every exercise that Joel moved the participants through, beginning to advanced, Ben tried. And SUCCEEDED, at least on some level. 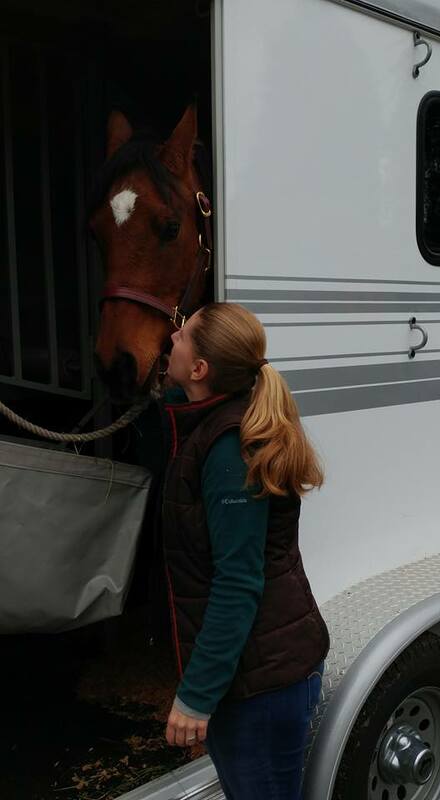 I am so impressed with the effort this big guy puts into everything; as long as he understands that there are no consequences if he doesn’t understand, and he knows that I will wait for him to figure it out, I believe this horse would be willing to try anything under the sun. 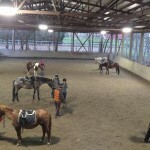 In the few days since the clinic, Ben had maintained a quiet, willing attitude, with TONS of deep, relaxed sighs, even during the riding work. 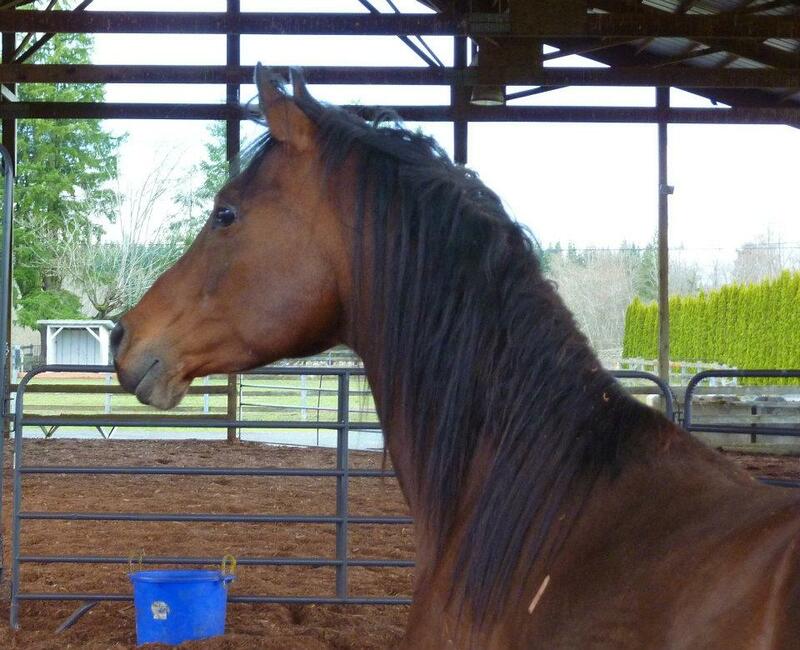 SO proud of the progress he has made and so grateful that this work was brought to the SAFE horses. 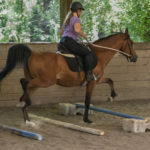 Sara S: Khianna- I worked with Khianna for the first time doing GW on Saturday morning, and was so impressed by her “try”. 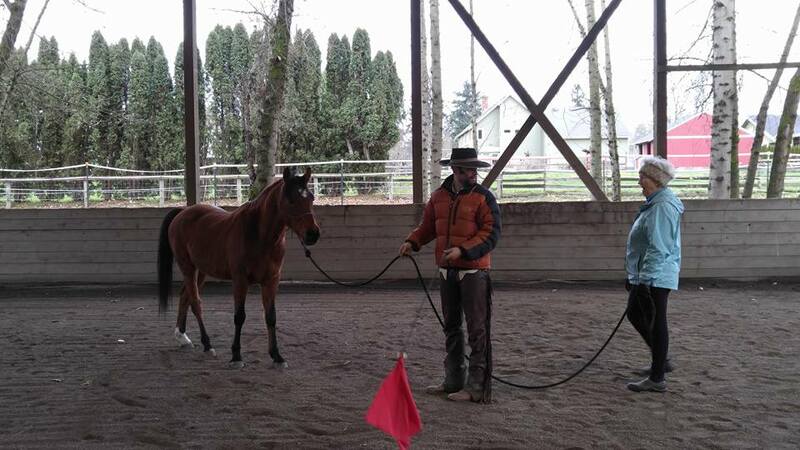 She does get a little nervous about the rope and flag coming at her while moving (though not at all while standing still in the comfort of the “herd” (me)). 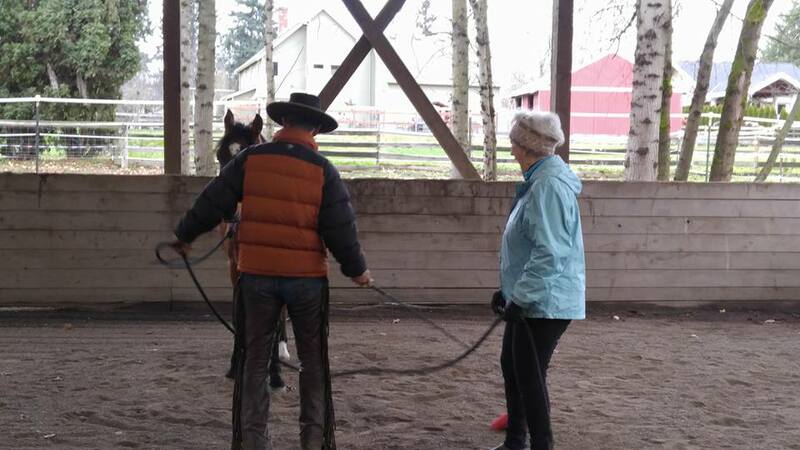 I particularly enjoyed the backing exercises, and she was so in tune with my feet and body language it felt like we were dancing partners! She is such a sweet girl. 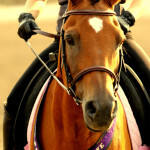 ‪Sara S: Phoenix- I did GW and rode Phoenix on Saturday afternoon. 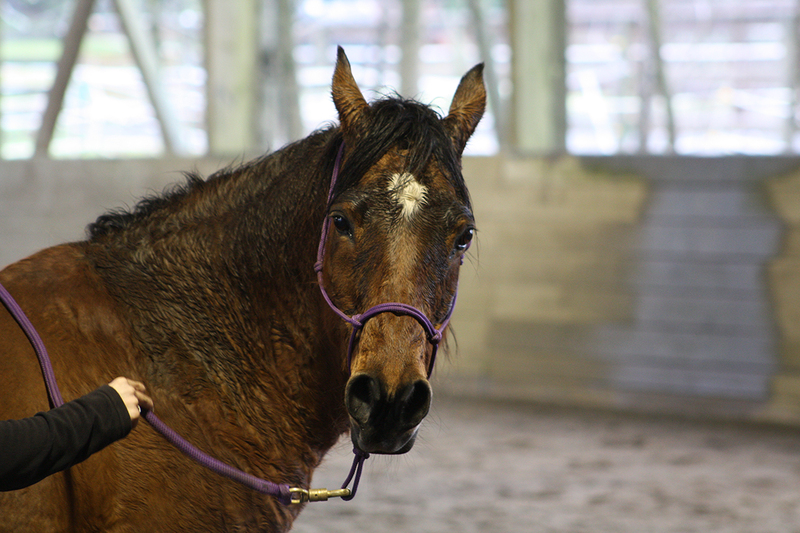 He hadn’t been ridden in weeks, and it was raining on the tin roof, so he was extra “special” to start, but after just a bit of GW he calmed down and started paying attention to me. 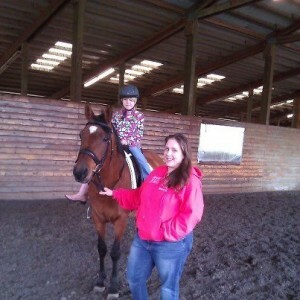 Riding, he was great. 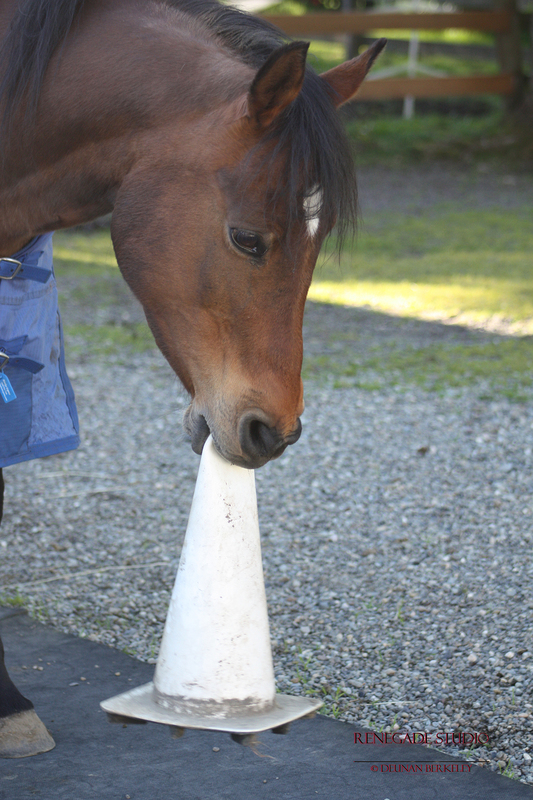 He’s getting very good at backing circles, front and hind yields (he’s so bendy!). Over the few months I’ve been working with Phoenix, I’ve noticed he tries very hard to anticipate what I want (if he’s in the mood), but as soon as I push too hard and/or he doesn’t understand what I’m asking, he shuts down. 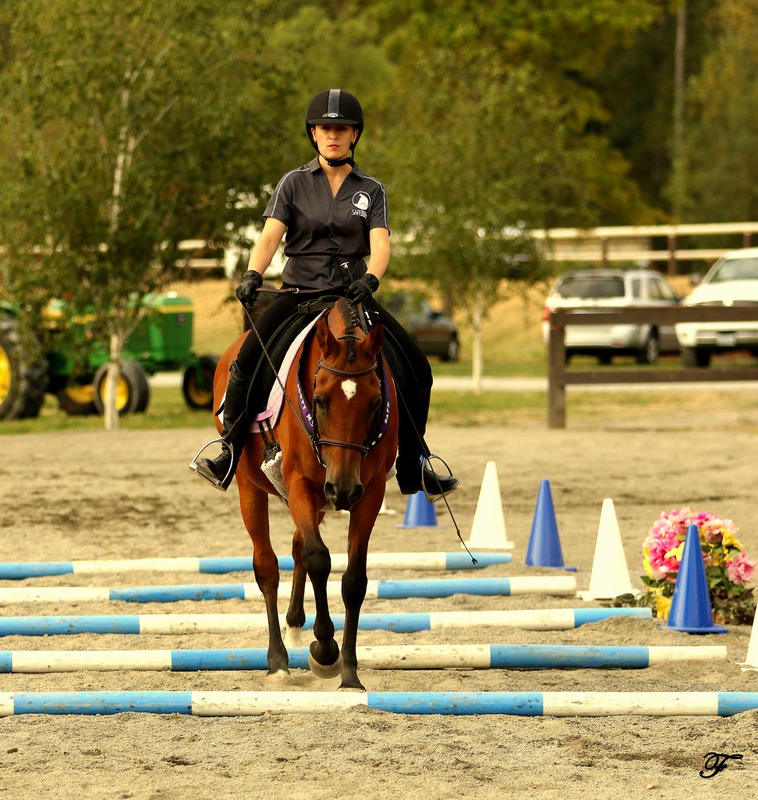 On Saturday, I didn’t feel him shut down at all which is probably a combination of both of us getting better at this! And many thanks again to Joel and Terry for putting on such an inspiring clinic!!! I wish I could come out to SAFE every day, but I’m glad to be even a small part of this great community and cherish this opportunity! ‪Claire C: Mesquite- It was my first official time working with Mesquite, and I think we made some really good changes. 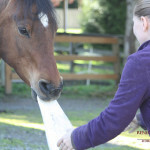 He is super sensitive so it was interesting to experiment with him and see how much pressure he needed. 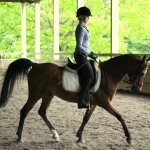 I only did the groundwork session with him and it was fun learning to time up with his feet better. 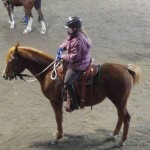 Claire C: Phoenix- For the afternoon session, I rode Phoenix, who I have not done a whole lot with either. 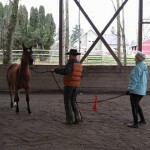 He was also good; we worked a lot on more forward motion and keeping him focused on what I was asking. 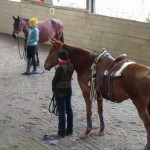 We did lots of bending and yielding, which was so good for him. Overall, he did very well. 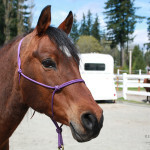 Casey A: Stella- I worked with Stella, who is turning out to be a great little horse. 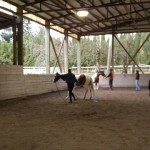 We worked on slowing down and developing balance on both the ground and under saddle. We were both so much lighter by the end of Sunday, and I know we got a big change in our partnership. 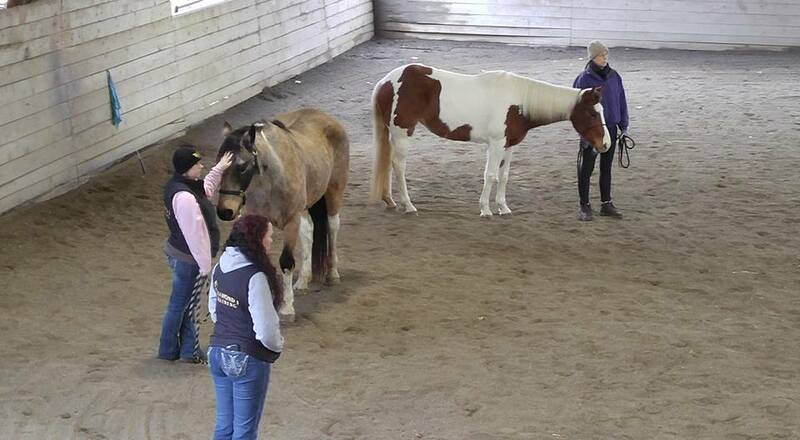 She was so relaxed through the entire clinic, even when horses around her were nervous. She’s also pretty resilient and forgiving of my mistakes. She has taught me so much, and she is going to make someone really lucky! 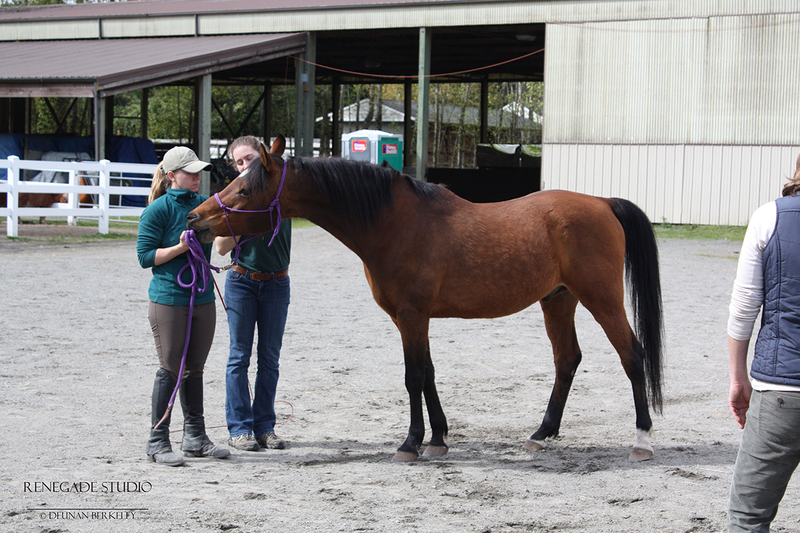 Erika S: Maggie- I worked with Maggie for all 4 sessions, and she did fantastic! 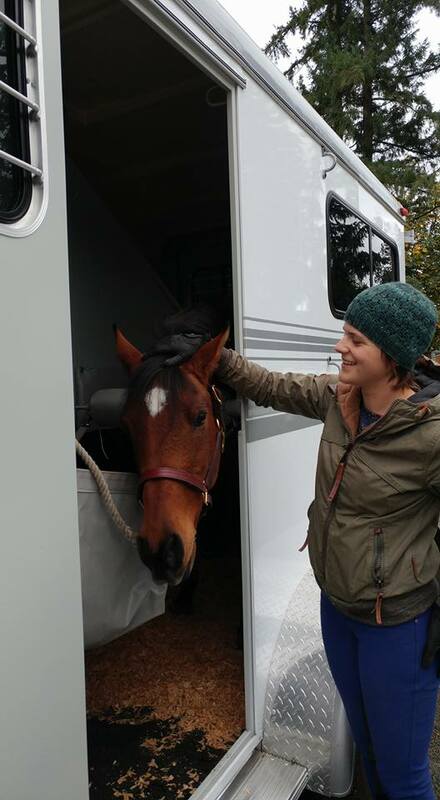 She’s such a smart, willing mare, and we connected early on. 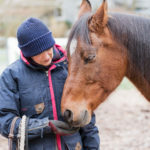 One idea that I heard this weekend was that eventually it will feel like your horse is reading your mind… Well, I’m here to tell you that that’s the truth! Maggie remained tuned in for everything we learned about, and worked in sync with me. It honestly helped me more than I think it helped her! 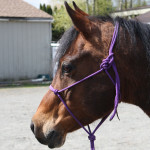 Ann A: Bridgit- Bridgit is a friendly girl and likes getting attention. 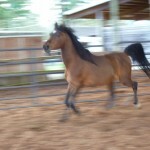 She is a bit on the lazy side and I had some trouble getting the life up in her while doing circling exercises. She just wanted to come into the center and hang out with me. 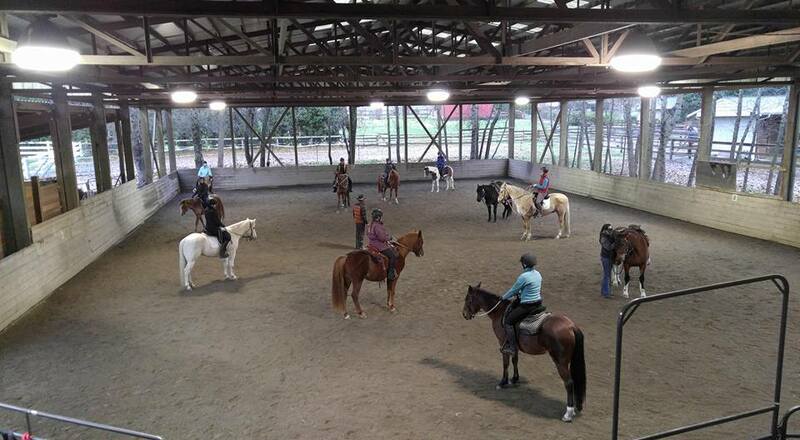 She made good progress under saddle in the afternoon sessions. 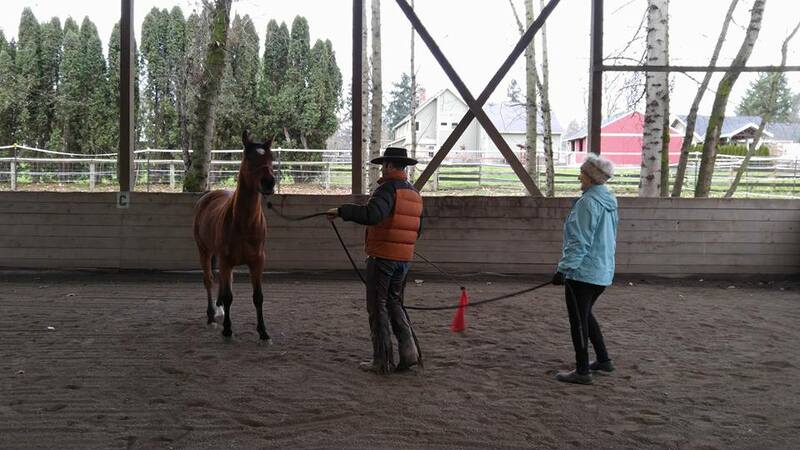 She was learning how to pick up a soft feel at the walk by the end of the first day and we had some nice walk/trot transitions. 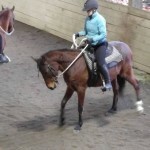 She needs more work backing straight and in a circle both on the ground and under saddle. 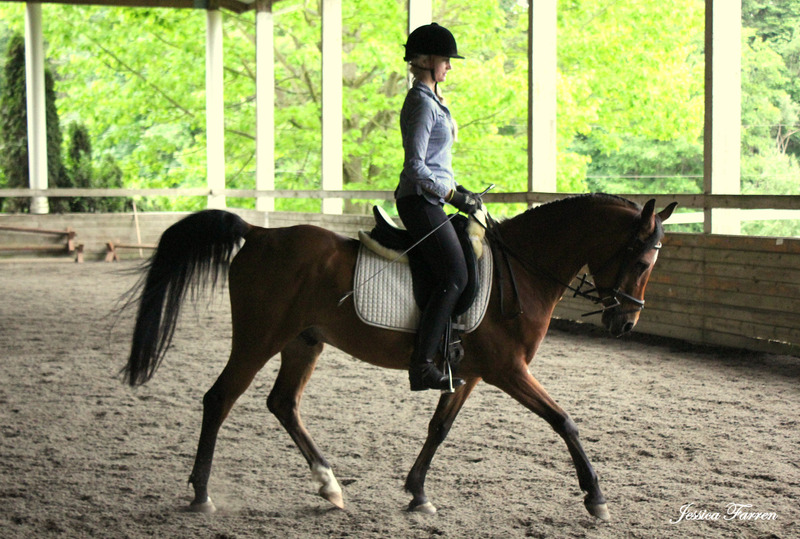 She also needs more work reaching with her front foot and disengaging her hindquarters under saddle. 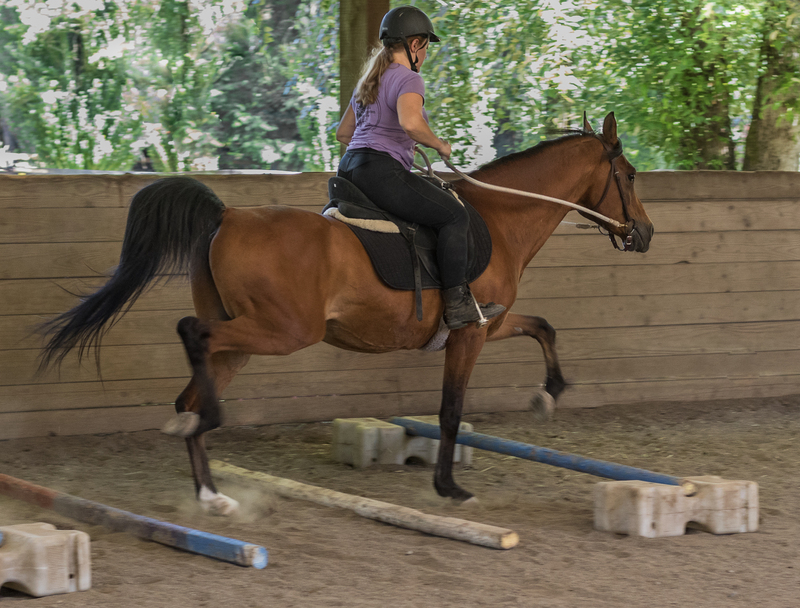 She felt much more balanced to me than she did when I rode her last summer. Jane M: Oscar- As a relative novice to practicing Joel’s horsemanship skills, the greatest lesson I took away from GW and riding Oscar during this most recent Joel clinic is the impact GW has on riding. 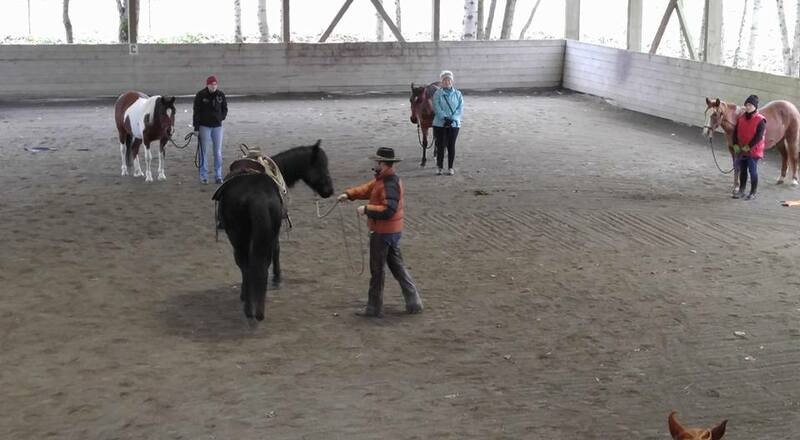 Yielding hindquarters, circling to achieve bend and balance, it all makes such a difference when aboard the horse. 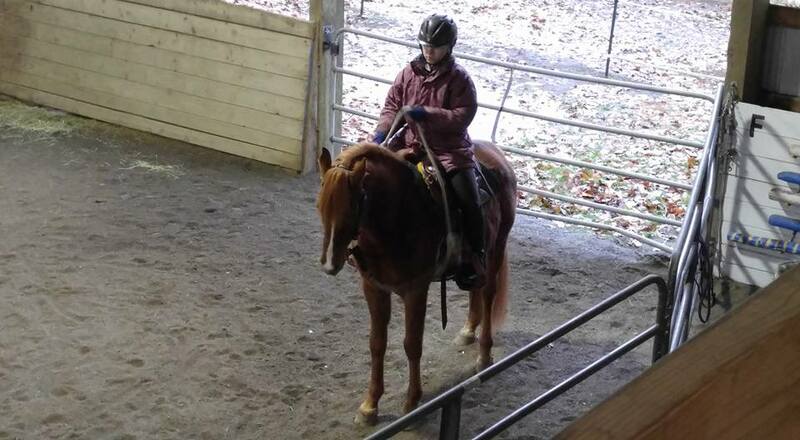 I’m able to apply lessons learned under Joel’s guidance to my regular riding lessons. It’s quite remarkable to me, and I look forward to Joel’s next visit and my next “aha” takeaway! Ben listening closely to Joel. 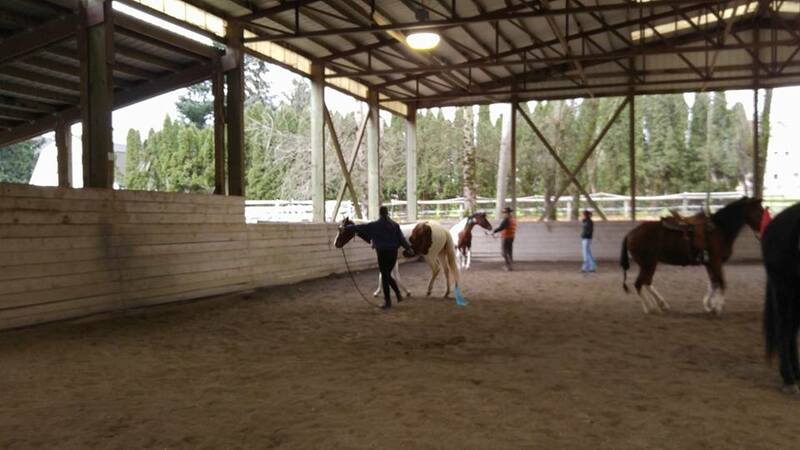 A few weeks ago, we had a wonderful group from Microsoft come to SAFE for a Day of Caring. 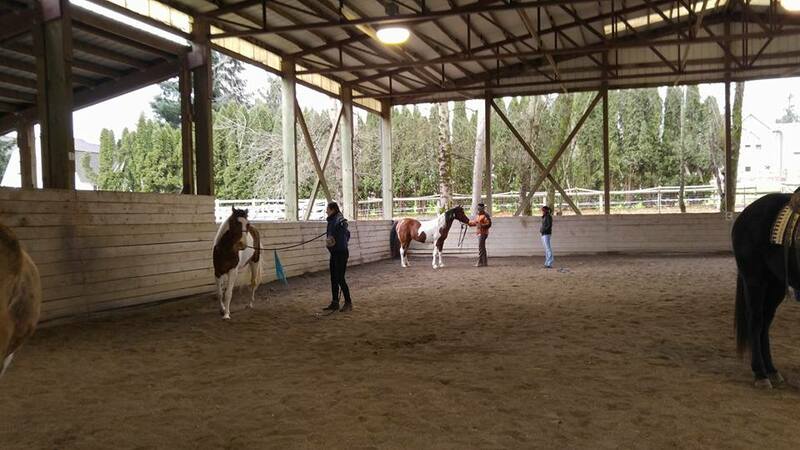 All the horses had to be out of the barns since the group was pressure washing and replacing gravel and mats in the stalls. 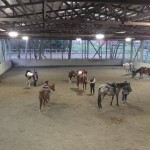 So we were a little short of places to put all the horses while the work was going on. 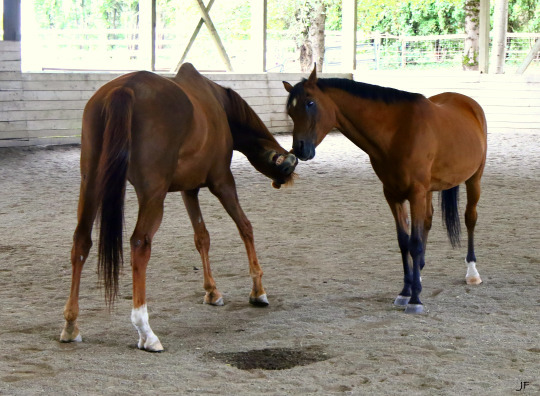 I decided to see if Ben and Oscar might be able to co‐habitate in the arena together for the day. To my surprise and relief, they became fast friends and really enjoyed each other’s company! So much so that they are now turned out together every day! Here are some great pictures of them playing together. As you can see they are like two young colts with their funny faces! But I have to admit I think Oscar is the boss…which is really funny since Ben towers over this little guy! 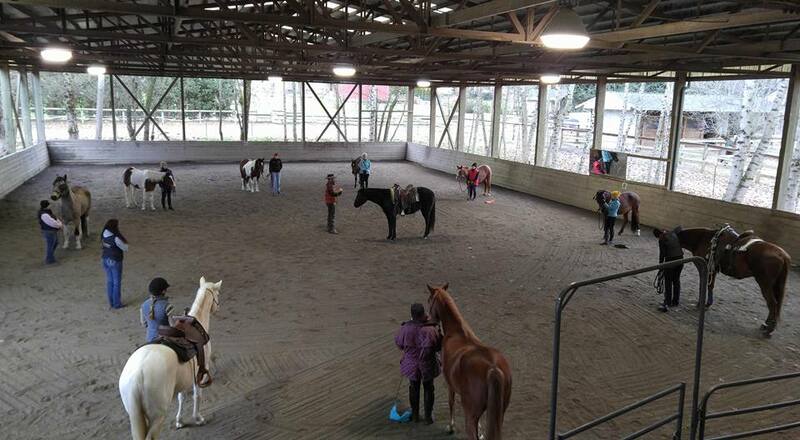 We have been working with Oscar on relaxing at the gaits and riding with just seat and leg. 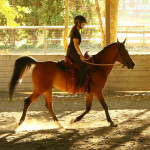 He is getting used to the light contact in the reins and that he can go around steady and without worry. 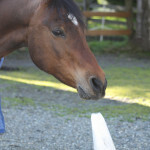 He is doing very well and finding his balance! 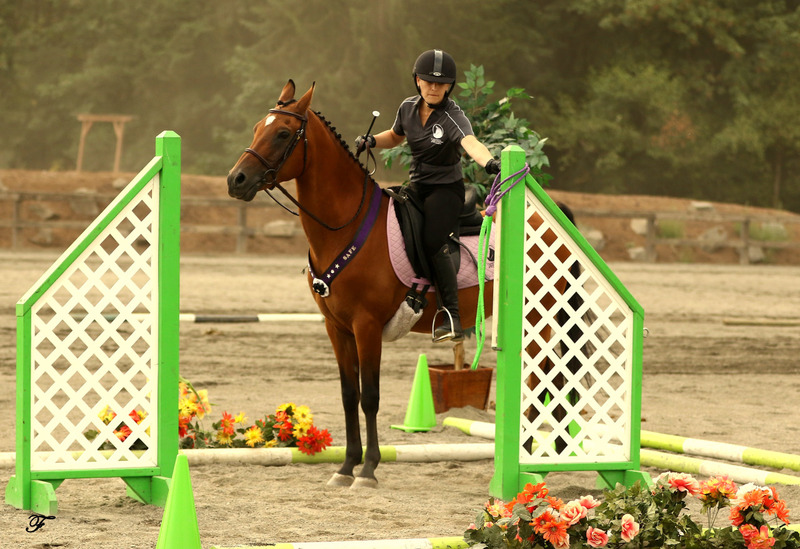 Oscar and his rider Casey Anderson were nothing short of amazing at the 2015 SAFE Benefit Horse Show. 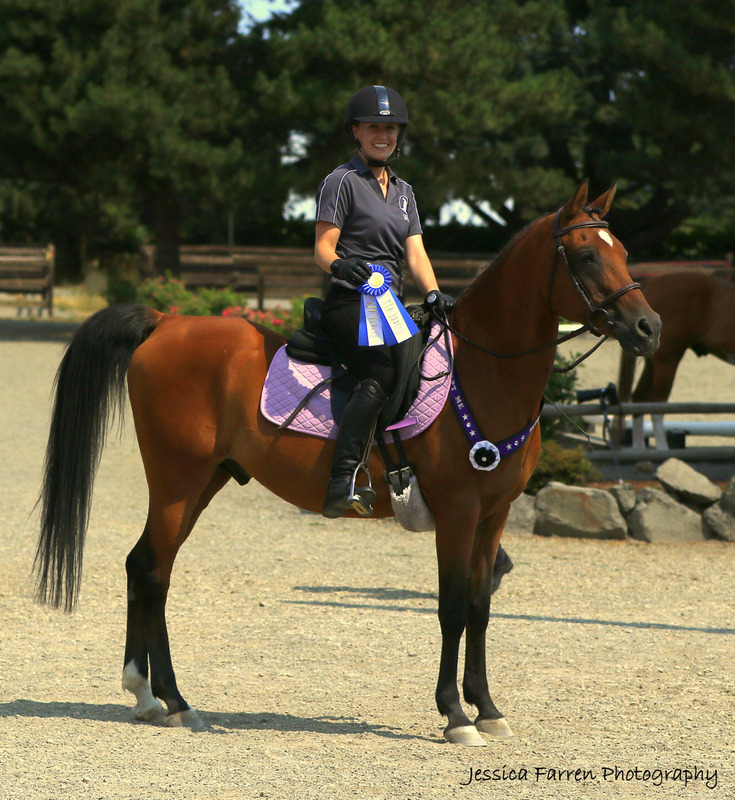 The pair competed in Dressage, English, Western, Halter, and Trails, and came away with 4 blues, one red, and one yellow ribbon! 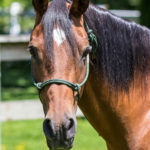 They won the Champion Rescue Horse award for the show, and because Oscar is 19 years old, they also took home the Champion Senior Horse award. We couldn’t be more proud of Oscar and how well he handled the busy show environment. 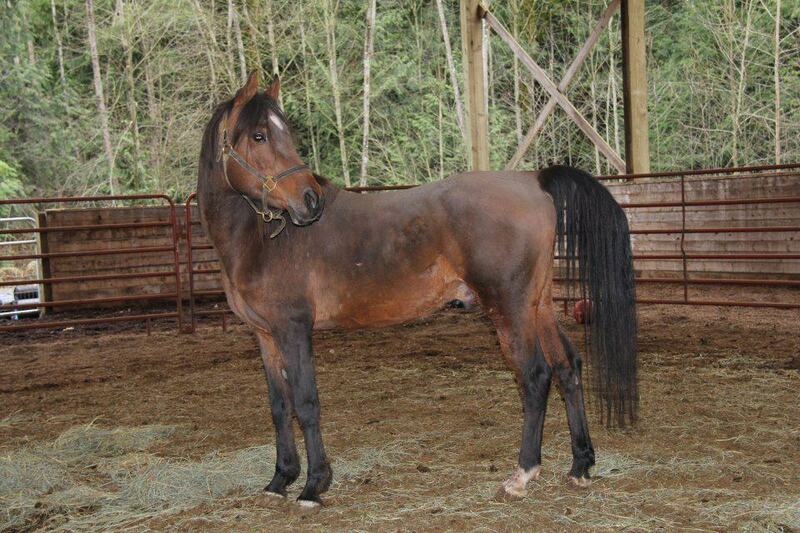 He looked like a million bucks, and the judges loved him! 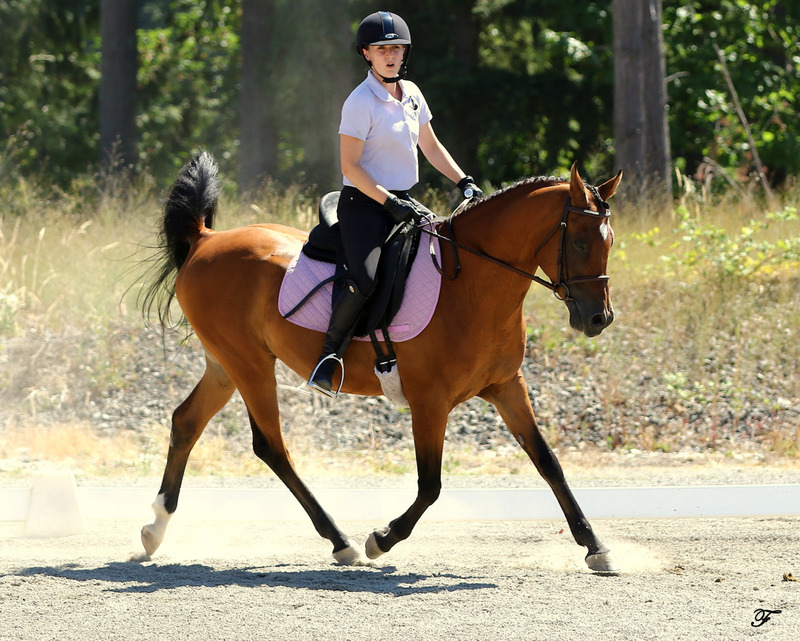 Here’s a video of Oscar and Casey in the Intro A dressage test, for which they earned a score of 65.625% and second place in the class! Annabelle was not terrific about getting injections for her sedation, but considering it’s probably been several years since she’s seen a dentist, her teeth were in reasonably good shape. Some sharp points but nothing significant. 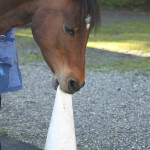 Jewel was a pill for her shots, but her teeth were in great shape. Dr M said that based on her teeth, Jewel is well into her 4th year and could be closer to 5! (For the record, we’re going to leave her at four!). Nothing too conclusive about her thickened left front knee. 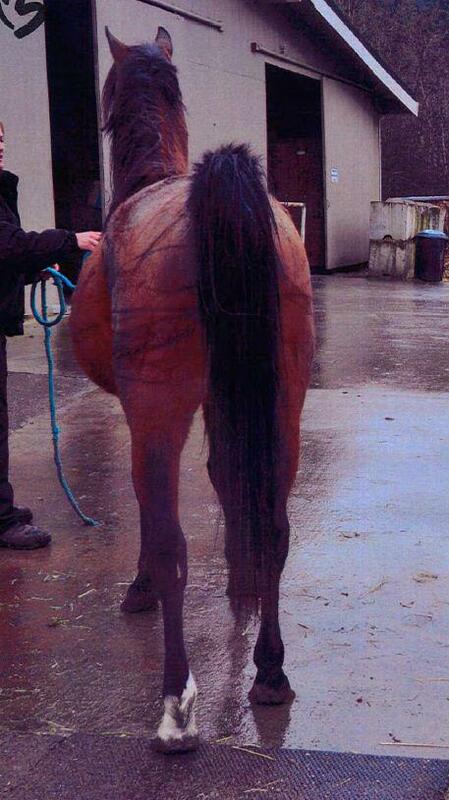 Dr McCracken said Jewel could have had soft tissue damage at some point and has some arthritis in that knee. 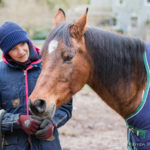 It’s unlikely that it’s a bone chip since those generally happen more in the knees with TB race horses, but we might x‐ray at some point to take a look. Oscar did considerably better for his shots, and his teeth looked good, but he does have some extra large spacing between some of his teeth on one side, which means that food can get trapped there and cause decay. She cleaned it out and said if he is good for us we can help by squirting water into his mouth to help flush his gums and remove anything that gets stuck in there. 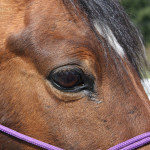 Dr McCracken also flushed his left eye to see why it is always tearing. 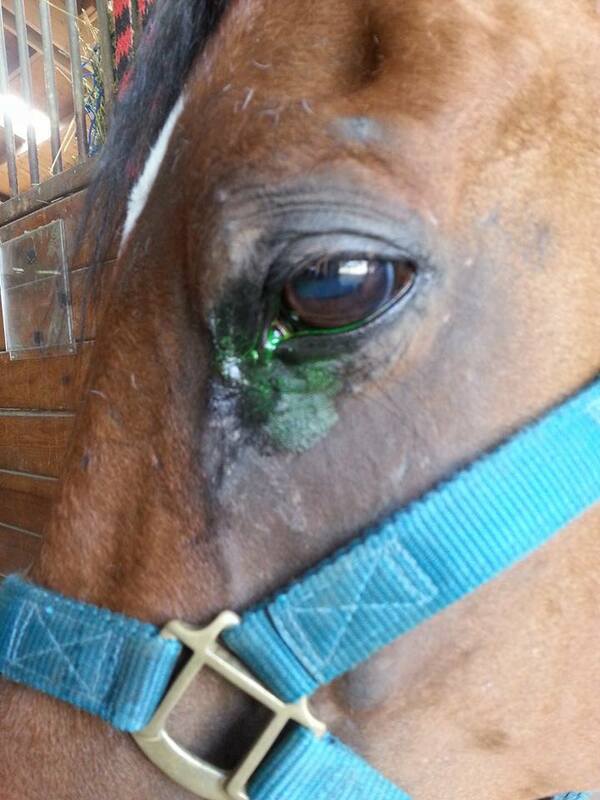 There was no clog in his tear duct. She also examined his eye using a little stain to reveal ulcers and scratches, but everything looked normal. Bridgit was an angel for her shots! Her teeth looked good too. 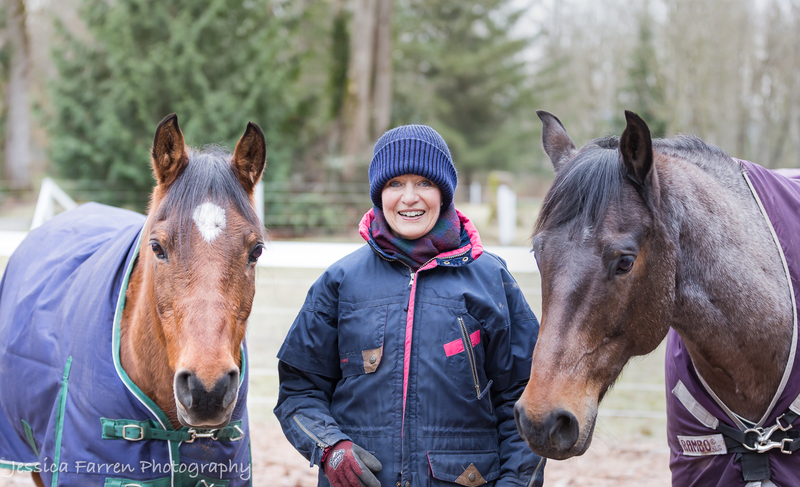 But here’s another surprise: Dr M puts her age closer to 3 years old!! She is still losing baby teeth! 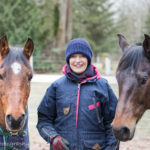 Bridgit popped a splint a week or so ago and Dr M advised us to give her another 3–4 weeks off until there is no heat in the area. 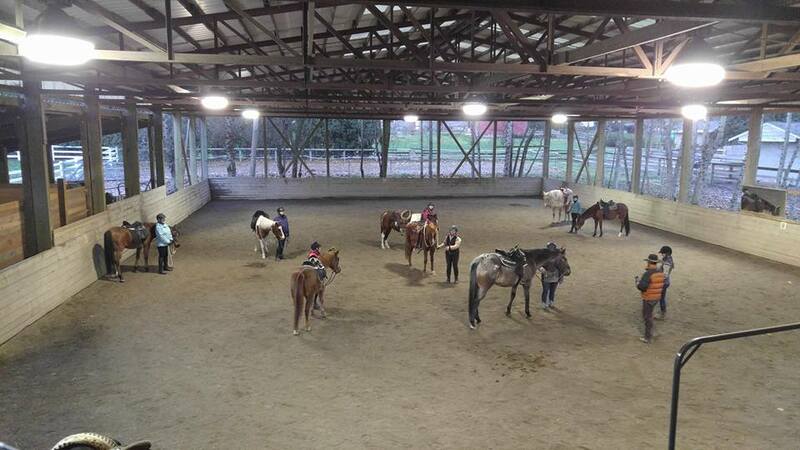 No that means that Bridgit won’t be at the SAFE Horse Show this year. 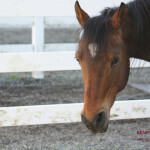 In fact she may end up going back to foster along with Sophie, which would be awful for her because she’ll have nothing to go all day but graze, snooze, and play in a huge pasture. Poor Bridgit! Lola we knew would be bad for her sedation, so we did an IM sedation to start and let that soak in, then came back to start the dental. She was still too awake so did have to give her more drugs this time IV and still not great for it. 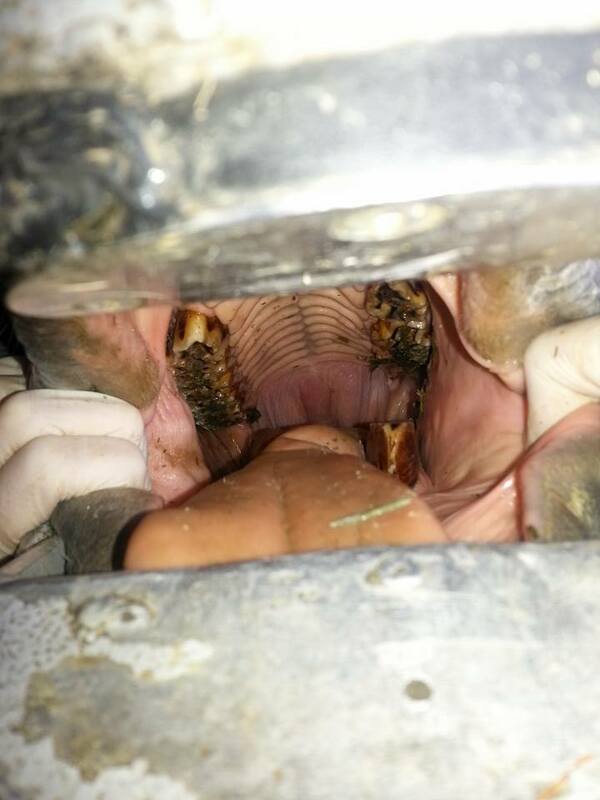 But her teeth were in good shape which made the procedure quick and painless. We will need to work on Lola’s aversion to seeing the veterinarian. She can be very difficult to handle when she sees them coming. 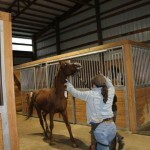 Fear based issues can be hard to overcome but it is important we help her through just like any other training issue. 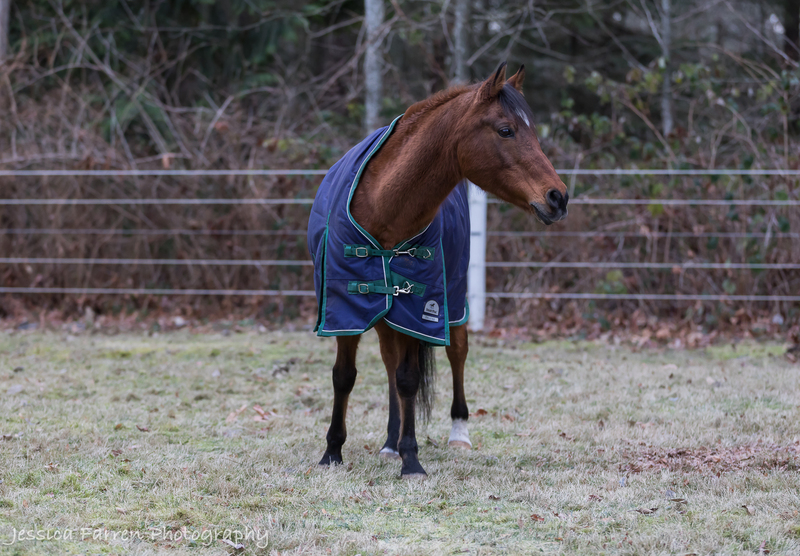 Lola has her strong opinion and self preservation and while we love her for it, it’s what makes her our endearing “sass‐apolussa mare”, we need to help her stay safe and understand vets are there to help her feel better. Khianna was good for her shots, but her teeth showed more sharp points than you’d expect to see considering she was floated in January. Dr M suggested that we plan to have her teeth looked at and possibly floated again in 9 months. 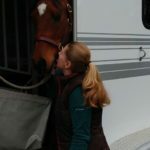 Finn also handled his shots like a pro, giving Dr M the chance to do an in‐depth evaluation of his jaw, which has had some unusual swelling for about the past month. The swelling has gone down some and she thinks it will just take more time. His teeth are very, very weird with the right top long, right bottom short, left top short and missing some and left bottom extremely long. She took a lot off the tall areas and it took a little work but she did get to a point where there was some contact now on both sides. 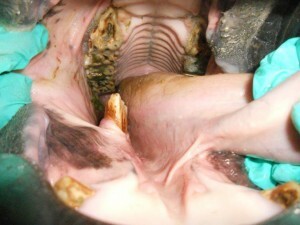 It is a slow process to correct his teeth and he will continue with the 4–6 month dentals for a few more times. 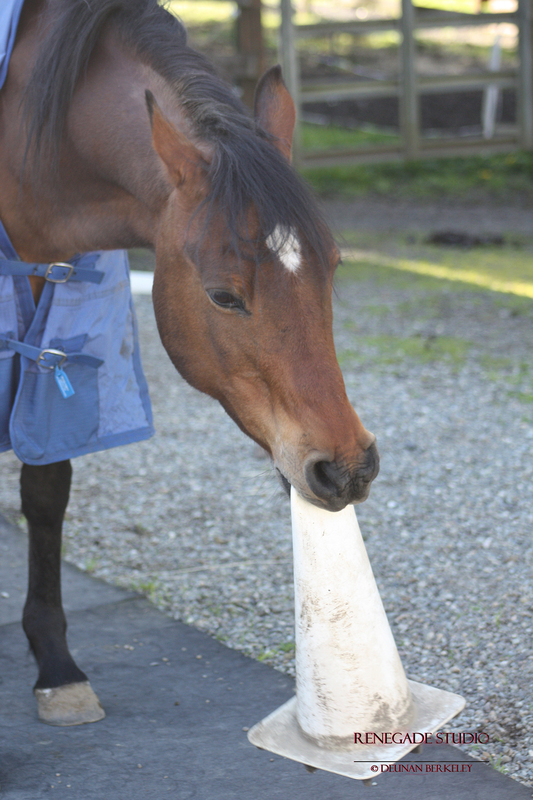 Dr M can only take so much off at a time and keep the tooth alive. He is a very sweet boy even with his funny teeth. 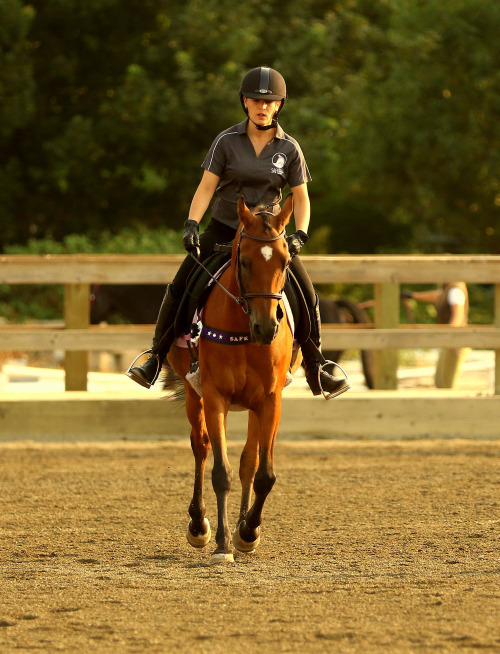 “Day 1 of actually sitting in the saddle on Oscar’s back was what I consider a HUGE success. Trust was built and appreciated on both sides. The first time Oscar was in my care, he was truly a solid citizen. 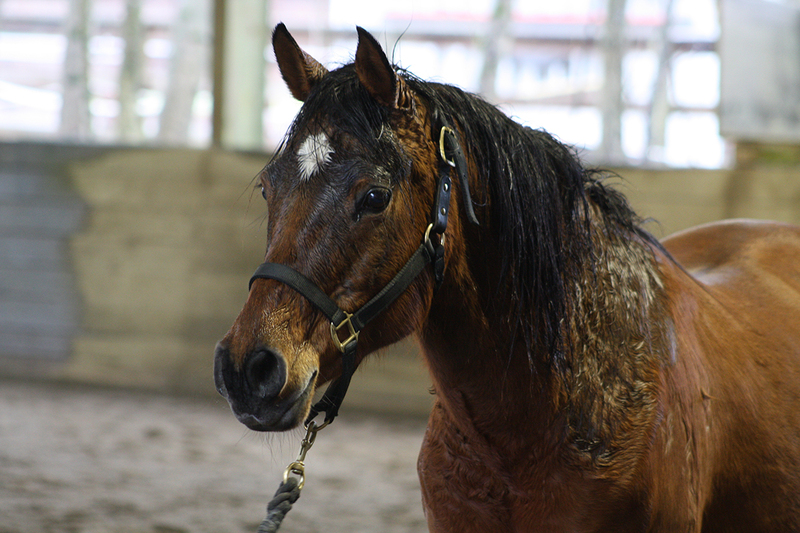 He had just come out of several months of training with Andrea and the training was perfection and I had no issues with Oscar whatsoever. He was adopted out quickly. 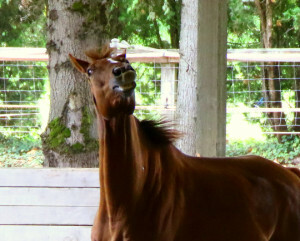 He definitely exhibited some ground manners that I did not remember first time around. They are no more. 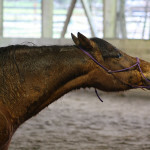 He exhibited some kicking out on the lunge line that I didn’t remember. They are no more so it seems. He has settled in. 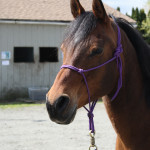 We have had bridle issues, nothing seems to fit. Finally found something that isn’t perfect, but fits reasonably well, just need to punch in a few more holes here and there, but it’ll do. 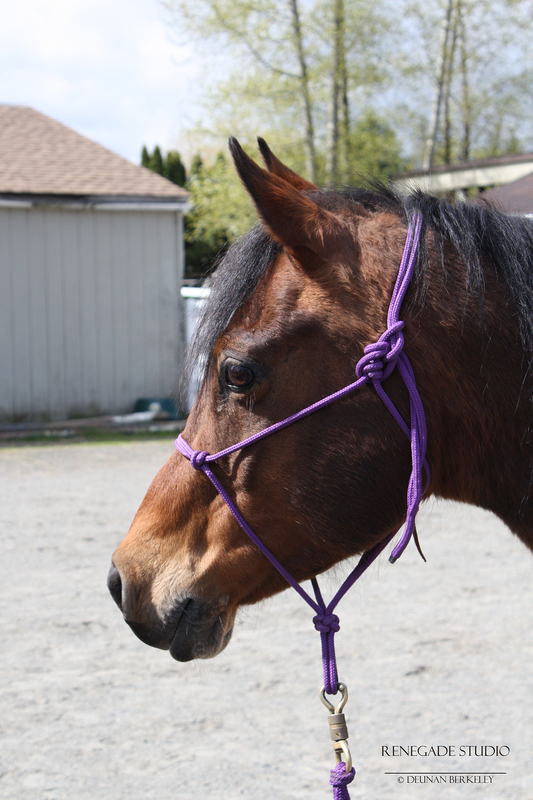 Anyway, tonight was the first night I lunged with the bridle. I was thinking to myself, “Will you get on tonight? You don’t have to, it’s perfectly fine to continue his training on the lunge.” “Okay,” I said, “just see how it goes, you’ve got him all tacked up if this goes well.” “It’s dark out,” I said to myself, “I wonder how he’ll behave?” Let me say first off, he performed the halt, walk, trot and canter via voice commands…every time. 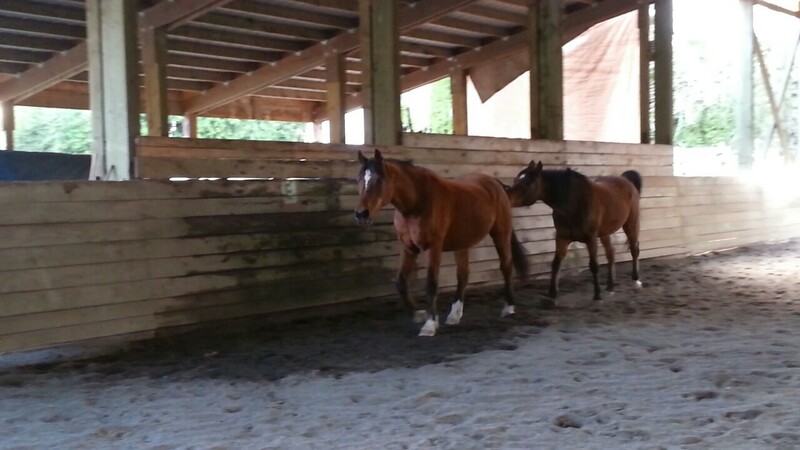 No bucking or kicking out. 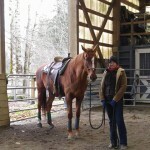 I decided to just put my weight in the stirrup and see how he behaved. Didn’t flinch. I did it again. 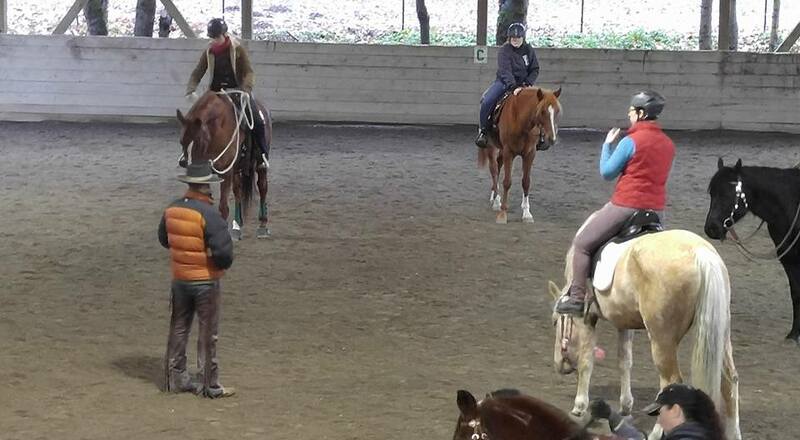 Stood straight up in the saddle. Nothing. “That’s it,” I decided, “I’m getting on. I’m feeling good vibes. 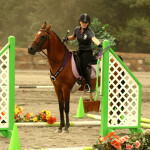 We’ll just walk.” I got on and the stirrups were WAY too short. That could have been a disaster if he decided to ditch me. 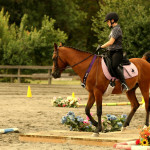 I got off, lengthened the stirrups. Still a solid citizen. Got back on, took off walking, he was attentive. 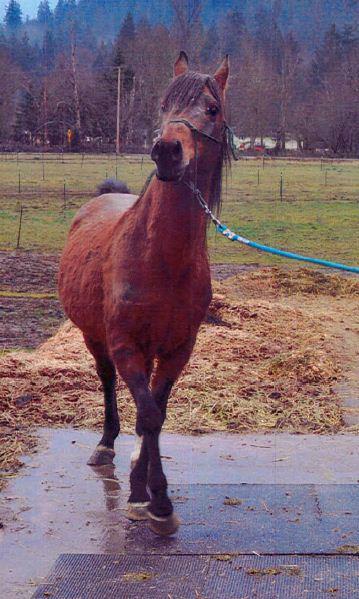 “I can’t stand it,” I thought, “you have to trot. Just see how he behaves. 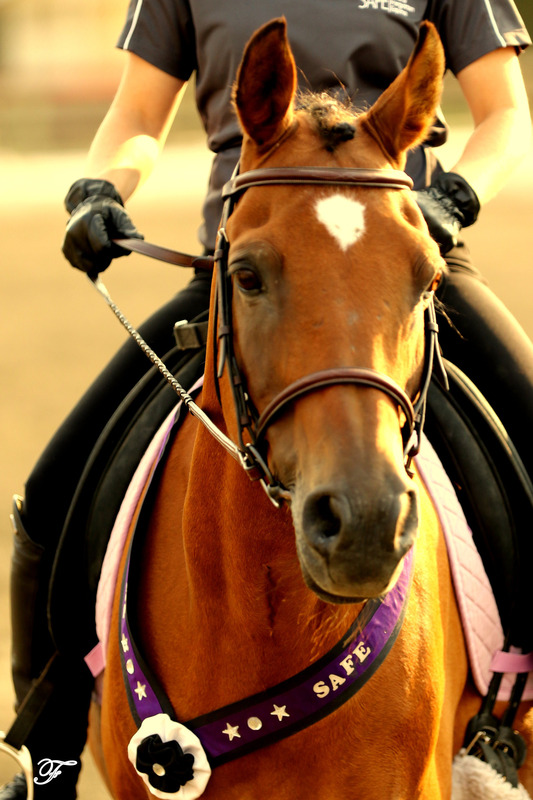 You’ve got this.” We trotted. Not a lot, but we went around, we reacquainted ourselves with each other, and it was a good thing. 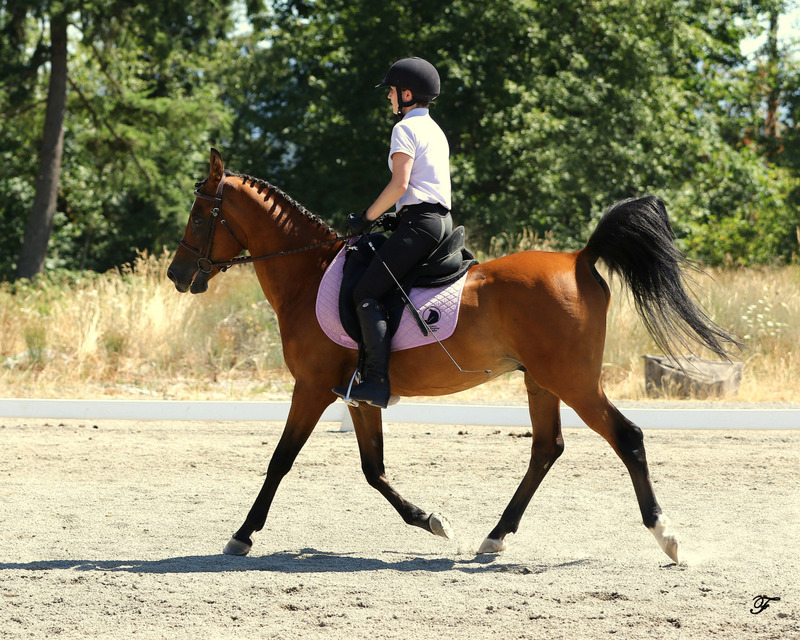 I forgot what a smooth trot he has…and kind of a big trot for a little horse. Oscar waited for my direction, listened attentively, no head shaking, no threatening anything, nothing. 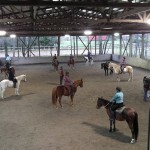 I truly consider it a win of a first day back in the saddle. We are off to a good start. 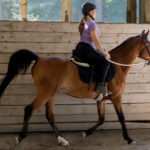 Phoenix: Going well under saddle with strengthening exercises in the walk including: shoulder fore, hauls, halt rein backs, and collected walk. 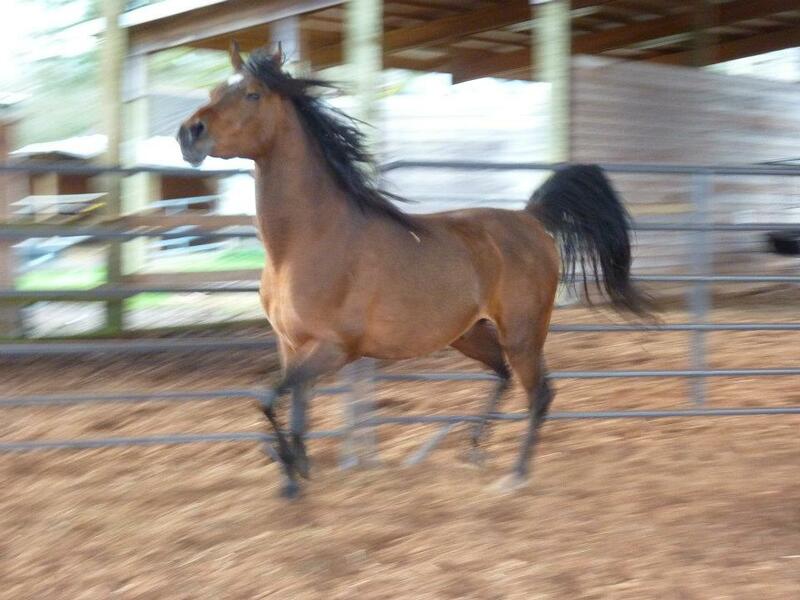 He’s up to 7 minutes at the trot and continues to look sound. 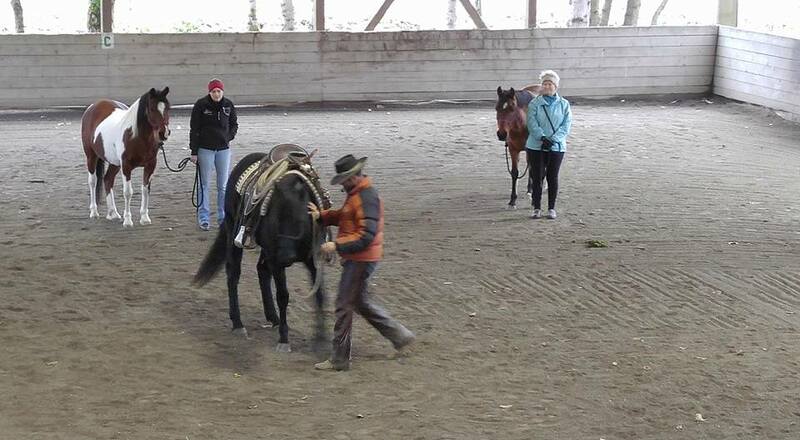 We’ve been working in some trot poles during the rides. 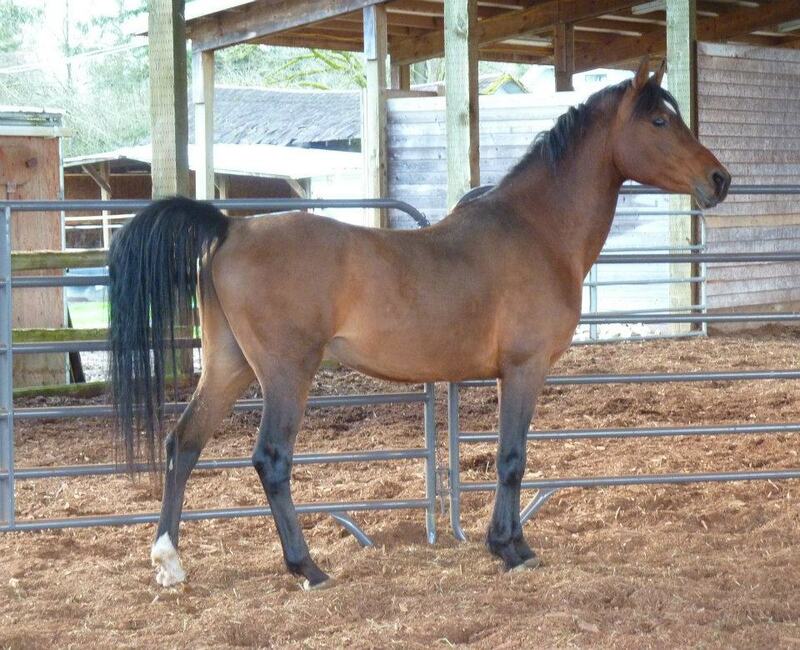 Jewel: Doing well at foster and looks to have filled out quite a bit this summer. 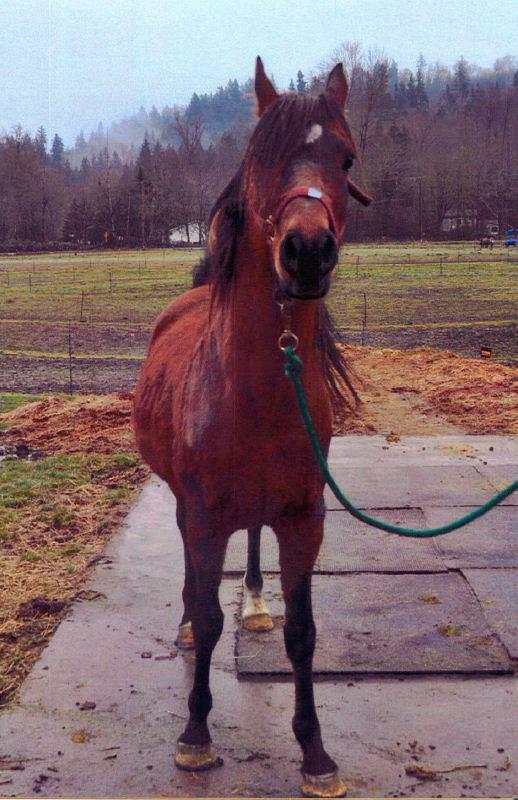 She been turned out with Ruby and everything seems to be fine, the two are “cohabiting” well. 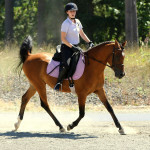 Lola: Lola continues to do well with both ground manners and riding. 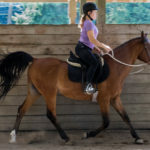 The canter has been our main focus this month and she is now consistently picking it up when asked and is learning to keep the gait for longer amounts of time. She is a bit grumpy about this at first but it is getting better. 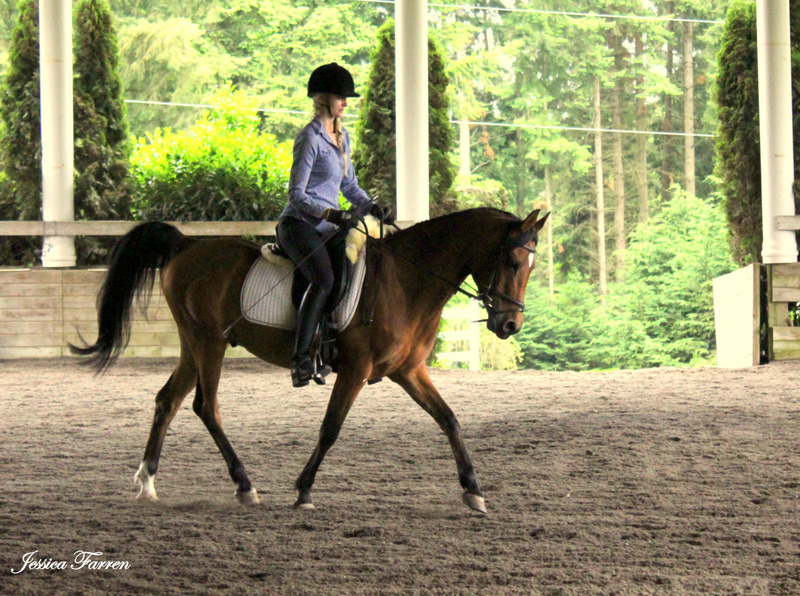 Some nice long canter moments have been happening. The key to improving this is achieving a true inside bend. 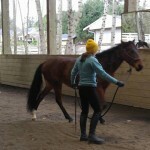 This will take a bit of strength building but she is getting some lovely forward and soft canters now. Kai: He does still have his moments of exuberant energy so I am continuing to work him in hand only. 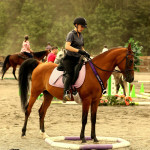 He is doing well over the trot poles and is stretching nicely. 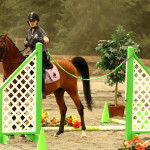 I have raised them up to keep them challenging and added polls to both sides of the arena. 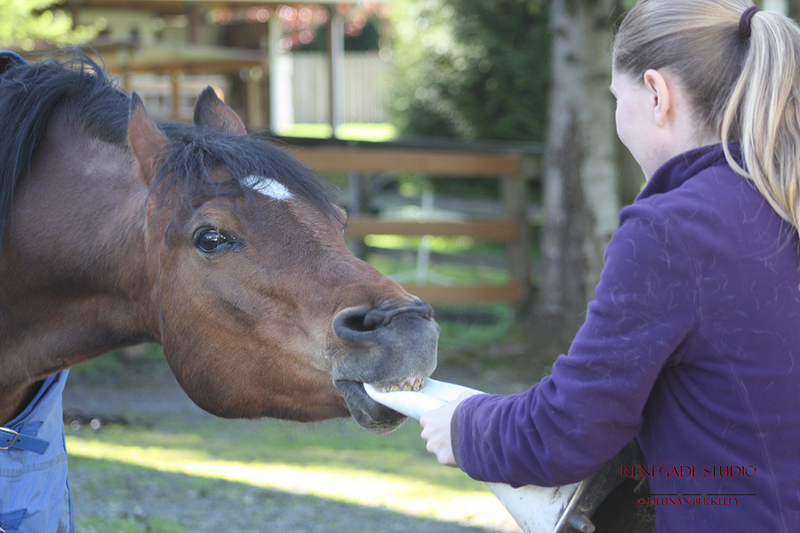 When he isn’t showing his nutty side, he is very lovely. 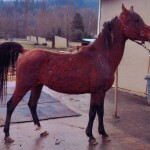 Sapphire: I saw Sapphire 3 weeks ago at Kim’s. She is looking happy and was sweet when I came to talk to her. 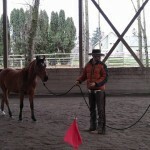 Kim is lunging her and has some very loose side reins on her and she is doing well. 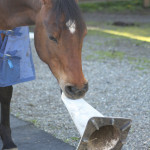 Oscar: He’s has three months off work, and he’ll have another three before we trot him again to evaluate soundness. 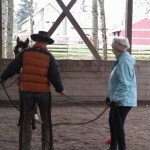 Helga said she can trot him on the lunge for us to see if he is sound when the time is up. Finn: While he remains sound with the work there is still a slight “offness” when traking to the left. I have to think this may always slightly be there but it is dramatically better than it was before the shoe package. 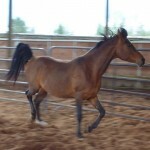 Cameo: Working on a nice balanced trot and feeling much stronger. Her left shoulder is still much more developed than the right due to the club foot. 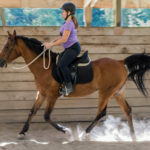 I have to use a pad with buildup of the right side so that the saddle sits level and on the middle of her, otherwise it will slide crooked the entire time. 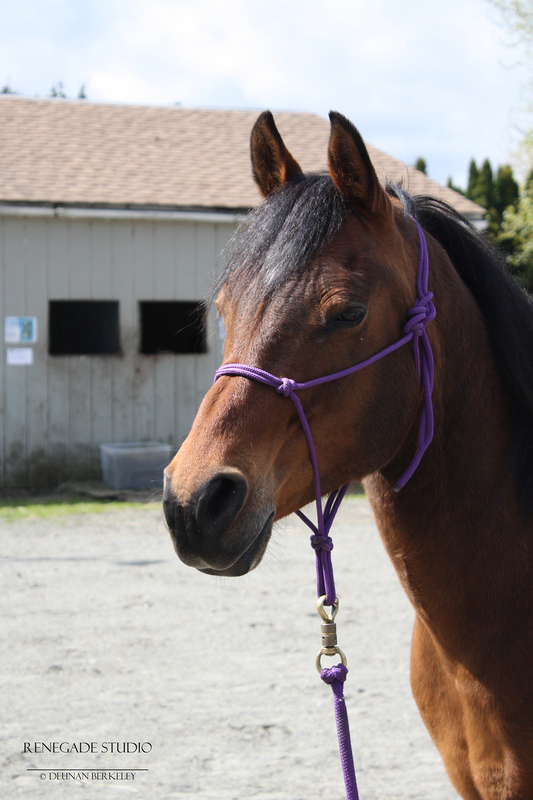 Skye: Skye has been a really great girl this last month. 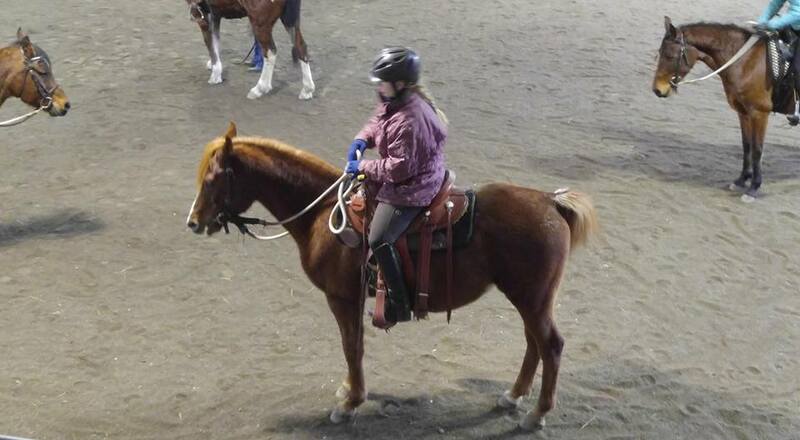 So much that I used her as my riding demo for the Chamber of Commerce evening. 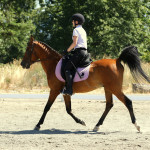 She was great with the crowd and did a nice walk, trot, and canter for them. 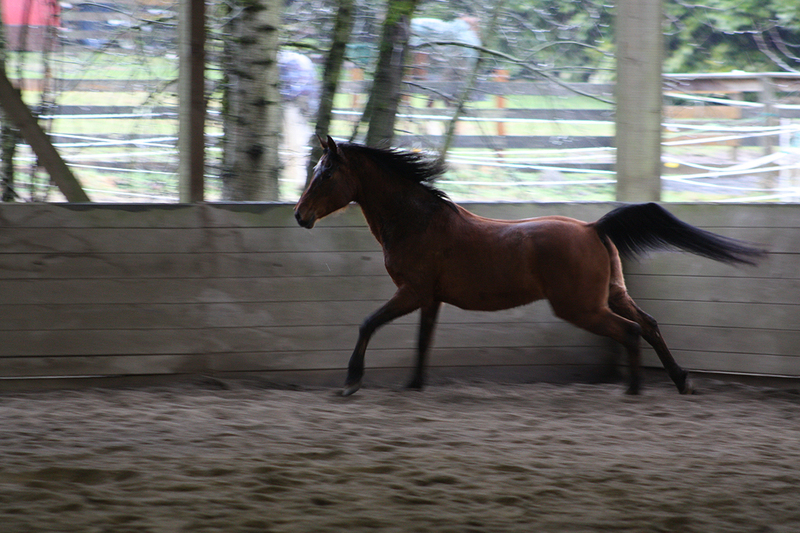 She is a beautiful girl and a lot of fun to ride! We continue to work on trailer loading and things are going well, all 4 feet into the trailer and quietly coming out. Ruby: Doing well at foster. We’ve been talking about her growth and whether we should wait to start her until she has more time to grow. I think not putting too much weight and heavy rides on her are a good idea. 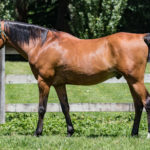 If this is SAFE’s choice, I suggest since her personality can be a bit young, big and head strong, would be a great idea to start getting the basics on her and working towards saddling well before she has a rider. 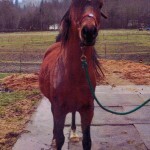 Misty: (From Kellie:) Bottom line is that Misty has improved, but, not as much as I hoped. 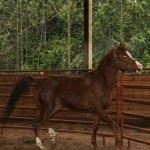 She is better at bending left and taking weight on the left hind than she was before the stifle injections. Fewer missteps as well. 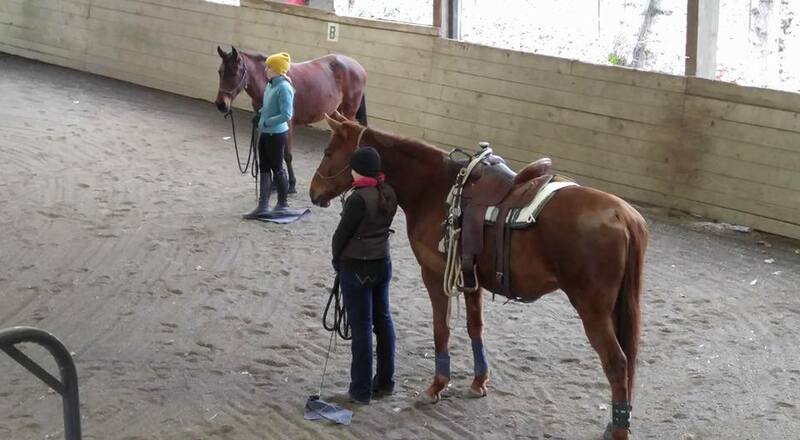 However, she is still very stiff to start out, for about 15 minutes, and this is in addition to the lunging time. 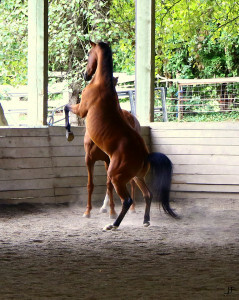 Sometimes she gets a short lunge if she is not too silly and other times, she might be lunging 15 minutes. 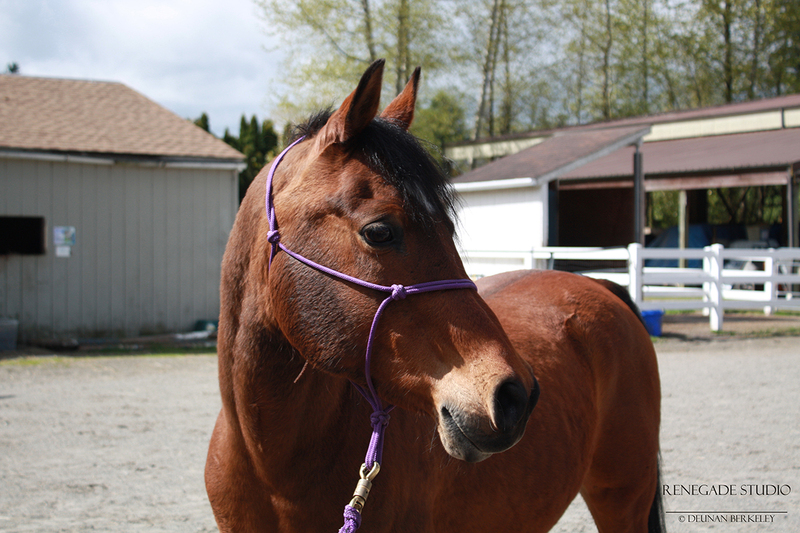 She has also improved from the donated chiro and the muscle relaxants. 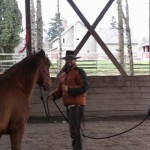 As the chiro vet said, it is best to bring them back to full work/strength slowly with the stifles. 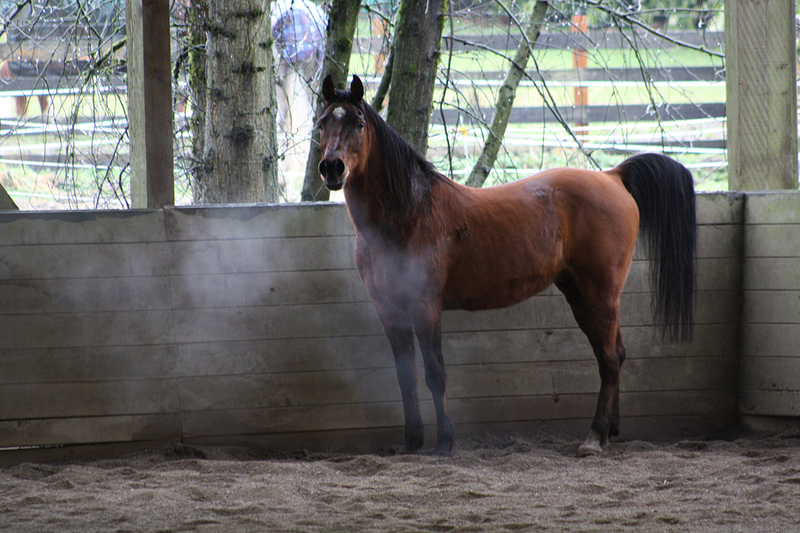 My goal is to get Misty out 4–5 times a week again, like she was before her May “stiffnesses and swollen legs”, but still low key work. 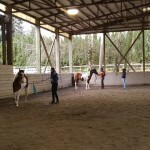 Some riding, some lunging, and to start some trot poles. I guess it was too much to hope that the stifle issue was going to be a “ quick fix.” Since, it has probably been going on for awhile– just like a person with a similar problem—it is probably going to be a longer rehab period for her. 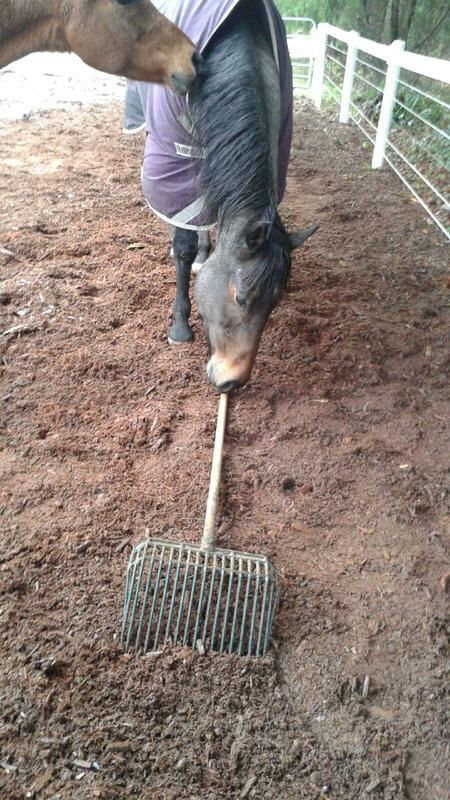 Lucky: Doing well WTC. 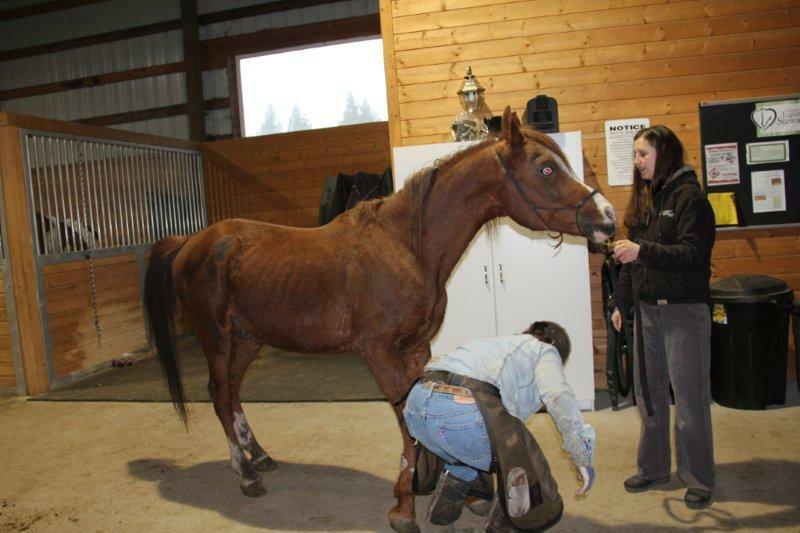 The 7 doses of Pentosan have helped him look less stiff in the hind end. 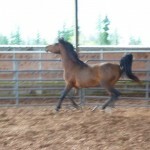 He shows no more hesitations going into the trot. 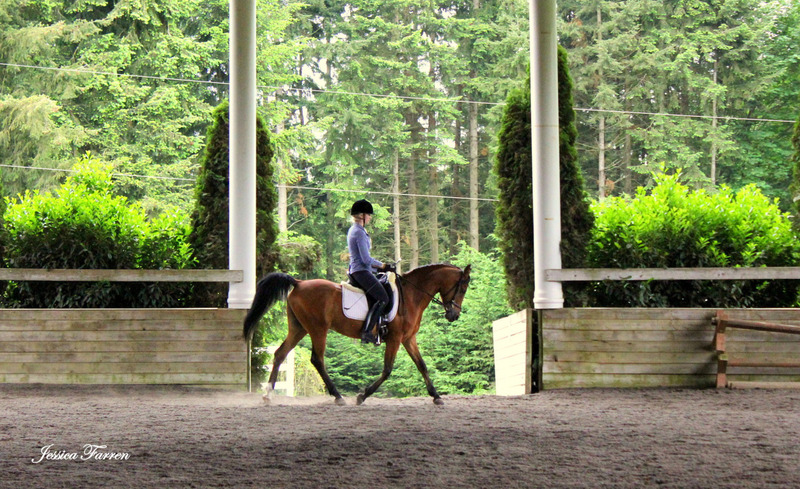 He does fuss a little when first asked for the canter but the next transitions up are usually better. He still looks a little stiff when tracking to the right. 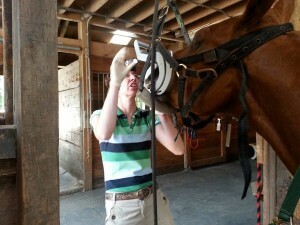 Also he is pretty tender on his front feet so we’re looking at putting front shoes on. 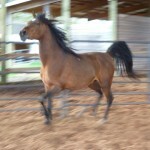 Oscar has been showing some front end lameness since his return to SAFE. 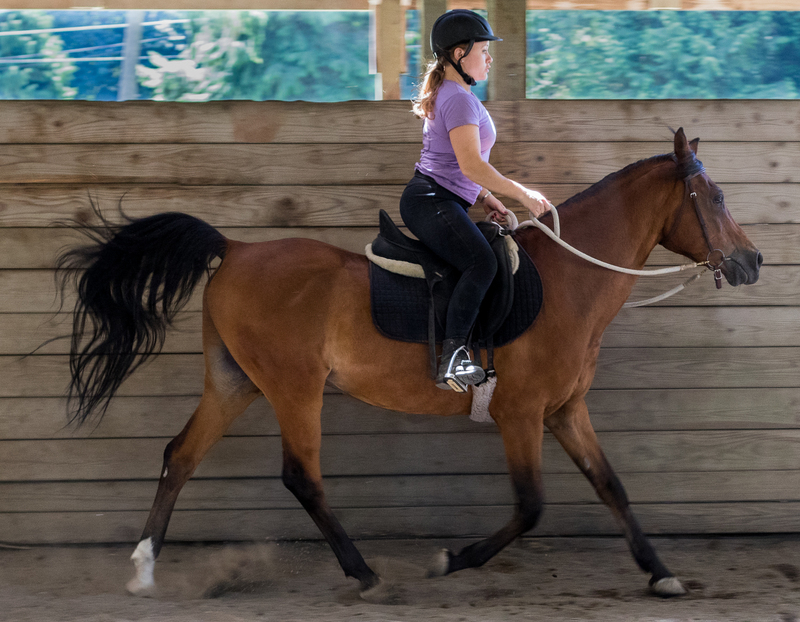 This lameness, which appears to be in his right front leg, isn’t noticeable at the beginning of a ride, but seems to get progressively worse as he is exercised. 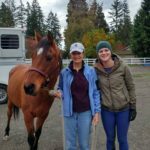 Dr King of Pilchuck Veterinary Hospital donated her time to perform a lameness exam on Oscar and help us get to the root of the problem. X‐rays were clean so we are likely looking at a soft tissue injury below the fetlock joint. 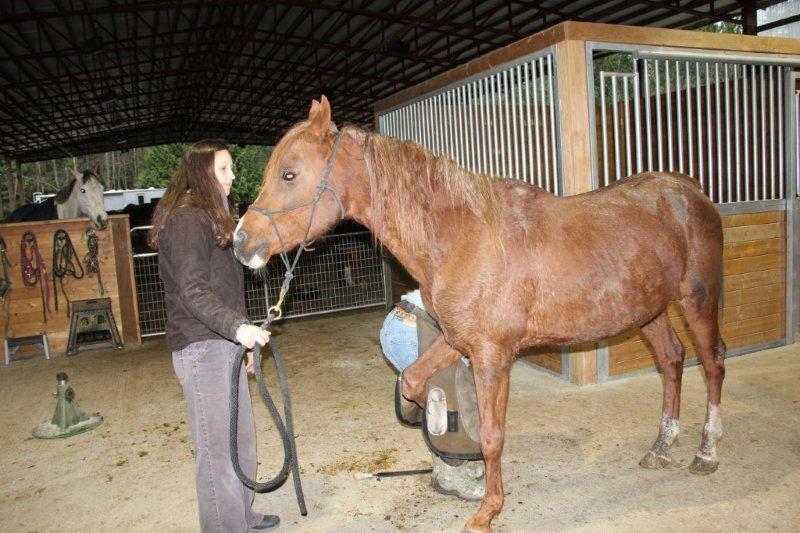 Possible diagnosis include injury to the collateral ligaments, sesamoidean ligaments, or suspensory extensor branches. An MRI would be necessary to pinpoint the injury, but since all of these injuries would require the same treatment, we’ve opted to move forward with stall‐rest and hand‐walking. We’re also going to change his trimming to rebalance his foot, as he appears to be putting all of his weight on the inside of his step which could either be the cause of the injury or the result of it. 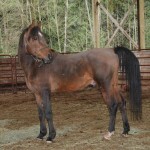 Either way, a change in the way he is trimmed will likely make him sounder and more comfortable over time. 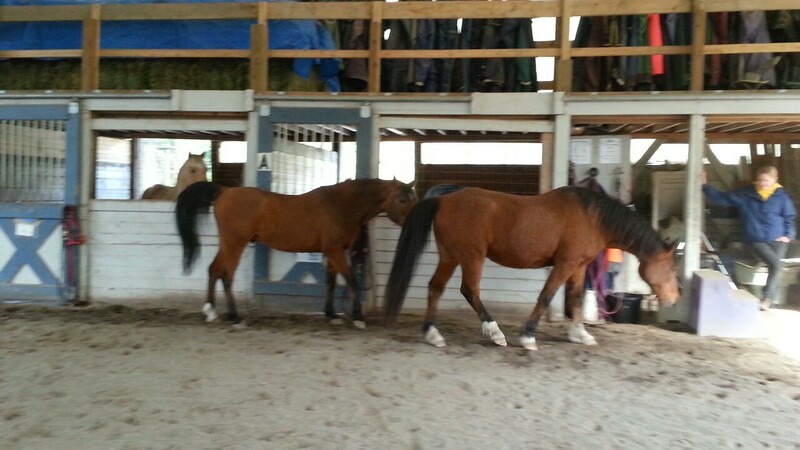 We were a bit worried about how Oscar would tolerate stall rest and rehabilitation, but so far so good. Terry reports that he’s doing great for his rehab and walks. He loves to roll and get groomed. 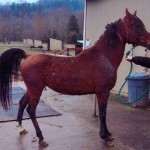 He is still itchy but per Dr Meyer’s suggestion we are trying him on Spirlina to help with allergies. 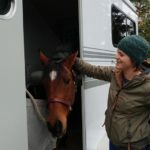 Not only are we super pleased with Oscar’s willingness to load into the trailer, we couldn’t be prouder of our wonderful trainer, Terry Phelps, and the amazing work she is doing with Oscar and all of the horses at Safe Harbor. 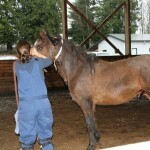 Her kind and patient handling is paying off with horses like Oscar. 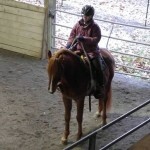 Oscar has been doing much better under saddle, and we’ve seen good improvement in his willingness to move forward. Also the Dynamite Vit has helped his lethargic behavior and he is not drifting off while we are working with him anymore. 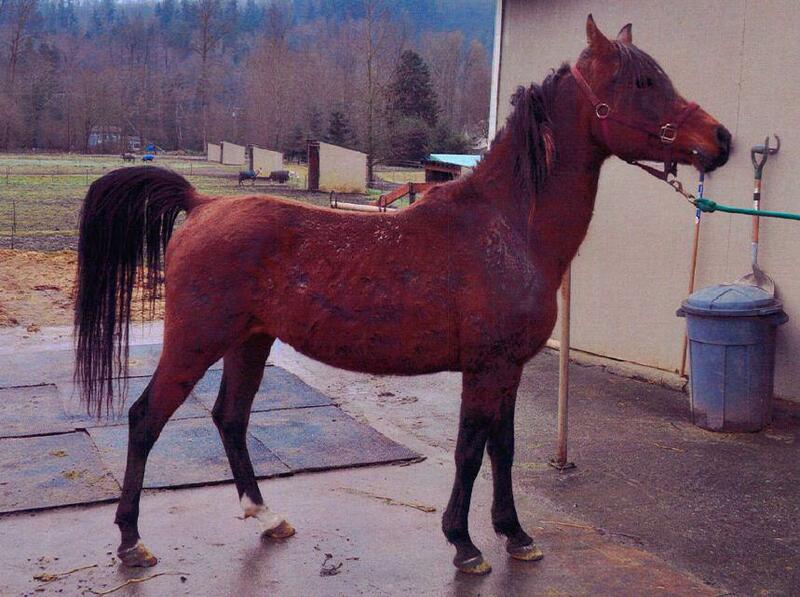 He still has issue with dismounting so we are working on desensitizing this issue. 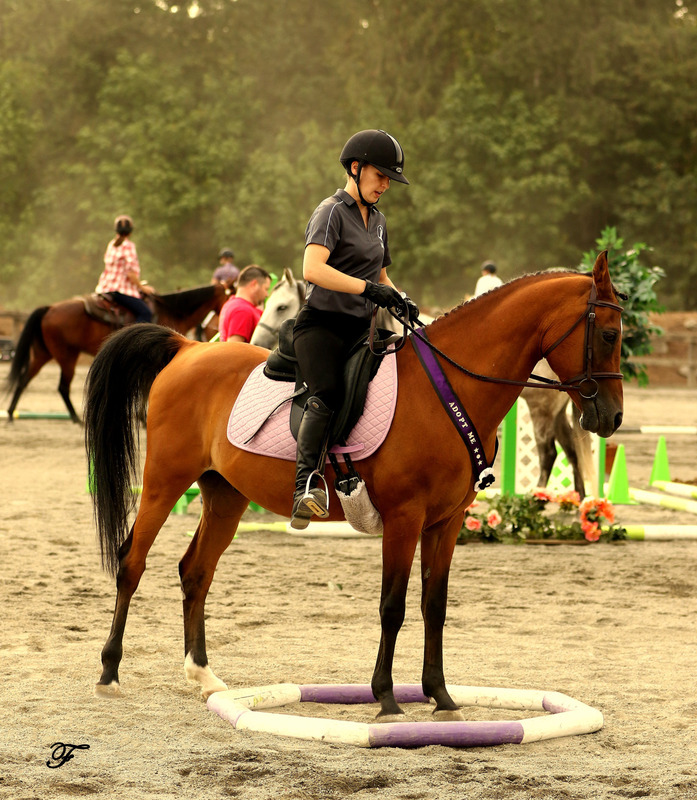 It doesn’t seem to be pain related because I can get off without a reaction if he is distracted and not anticipating the dismount. 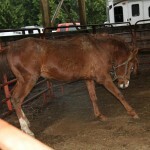 He has been continually slightly off when tracking to the left on his left front leg. 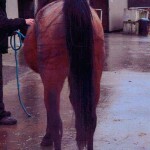 Dr Meyer adjusted him last week and didn’t find any significant areas to treat that would cause this. 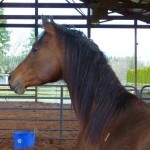 We may have a vet out to flex him soon to see if there is anything that can be diagnosed. 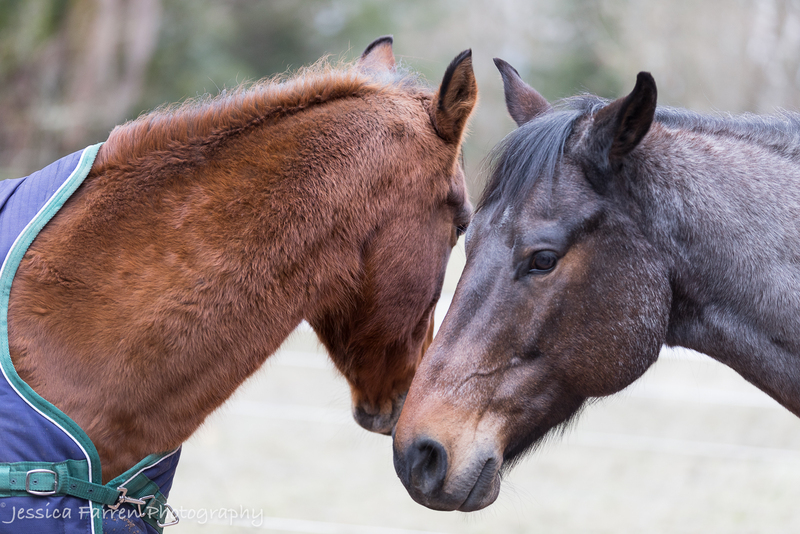 So Atticus has returned to Safe Harbor — his wonderful foster home had to bid him Adieu when one of their horses came home from training. 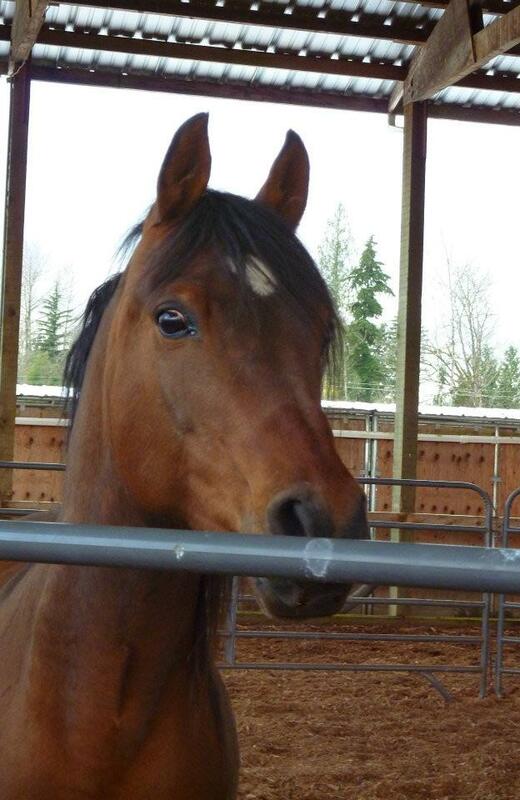 He’s looking like a million bucks, by the way, he had a great winter hanging out with SAFE alum Deeds. 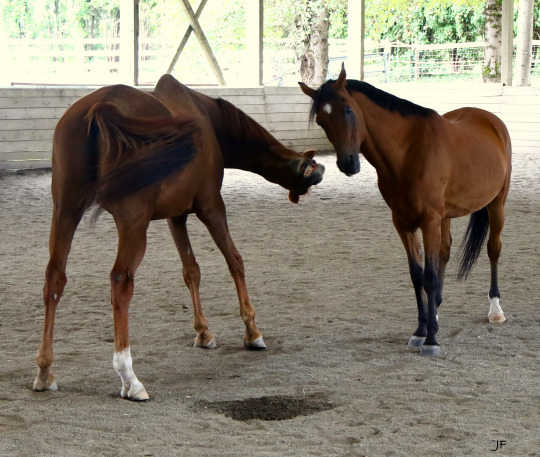 Terry turned him out in the arena the other day for some social time with our other handsome Arab gelding, Oscar, and the two of them had a great time getting to know each other. 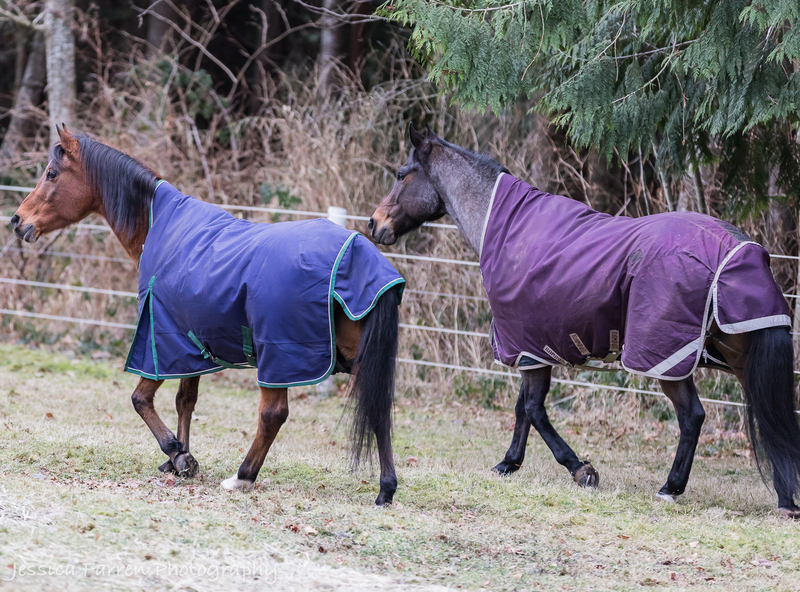 But everyone had to laugh when the two boys started marching around the perimeter of the arena, with Atticus in front and Oscar directly behind him, close enough to be holding onto his tail! It was quite comical. 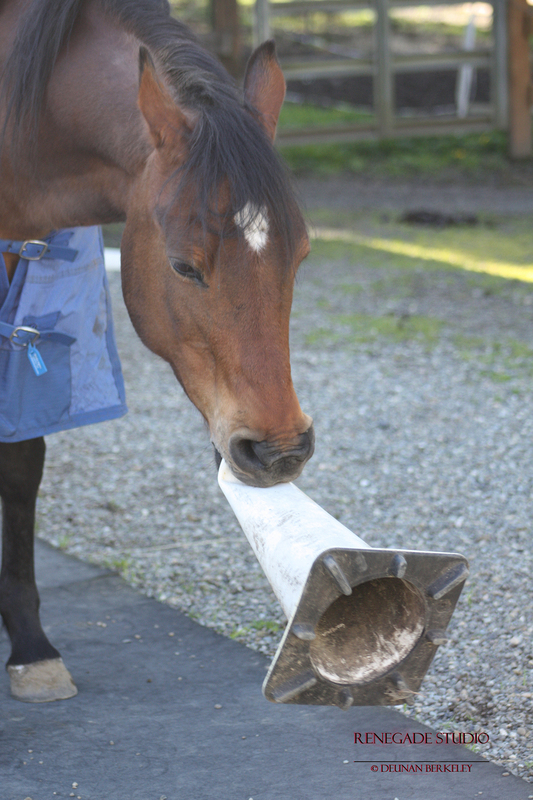 Horses do the darndest things sometimes! 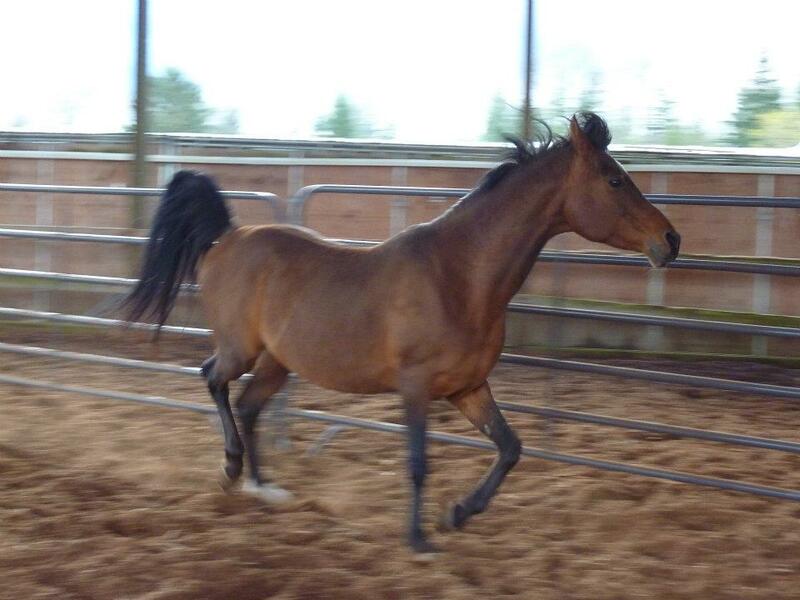 Oscar has been pulled from the Volunteer Rider program for now, due to resistance moving forward and some kicking/bucking at the leg. 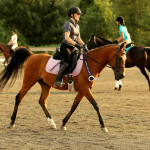 Saddle fit is an issue—he’s very sensitive to the saddle rocking on his withers. 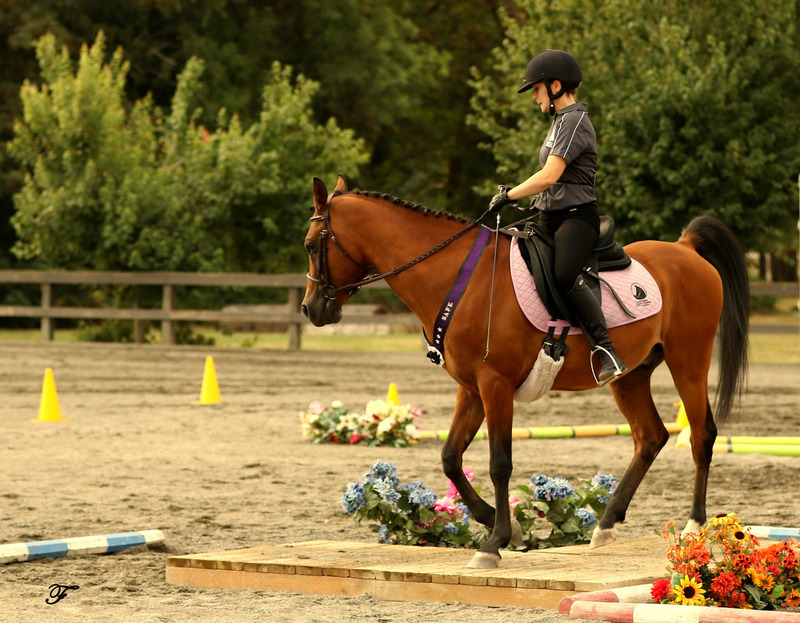 We have been working on his grumpy reaction when rider dismounts. 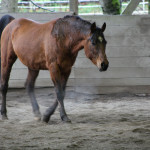 He is going forward better now but he’s still very much behind the leg and his rhythm is all over the place. 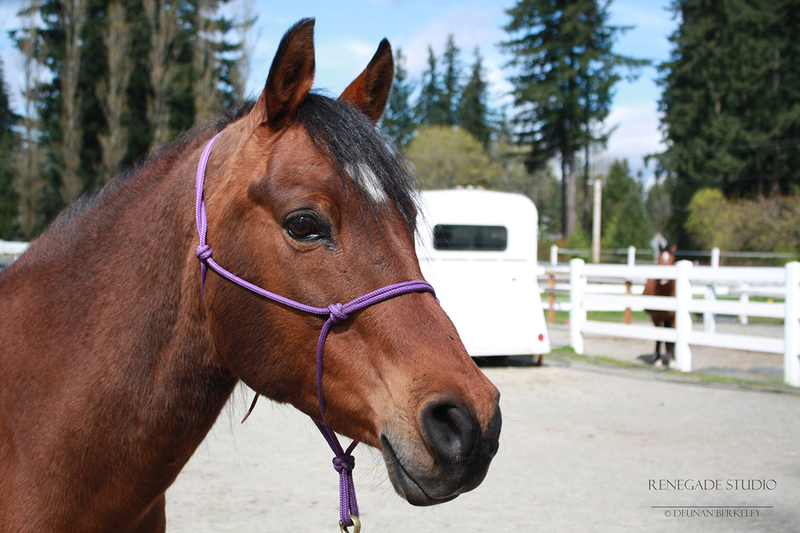 He is not ready for a volunteer rider to ride him yet but I’m hoping to reintroduce the better riders to him within the month. We have an old friend back among the herd at SAFE Harbor…the Arabian gelding El Johar Jamaal, formerly known as Oscar the Grouch, currently known as Oscar the Sweetie Pie. 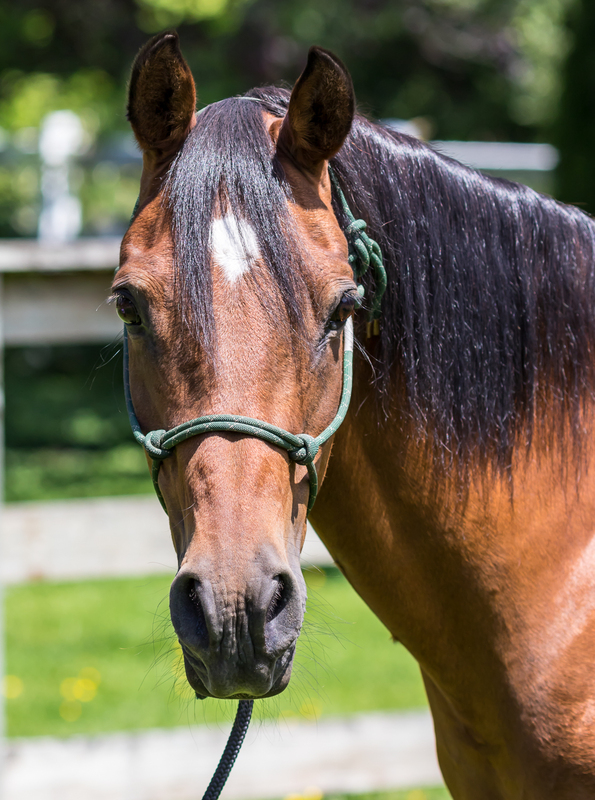 SAFE has elected to allow Oscar’s owner to return him to us to be rehomed, as we strongly feel that taking him back is in the best interest of everyone involved. 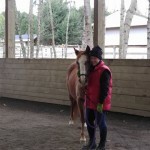 We are currently reassessing Oscar under saddle, and hope to have him ready for re‐adoption very soon. 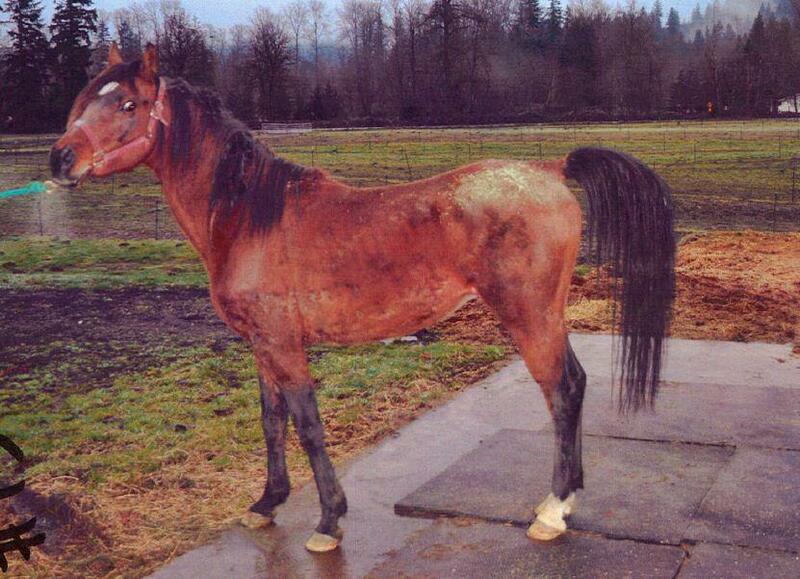 Oscar was one of 16 horses seized from a breeding establishment by Pierce County Animal Control in late 2011. 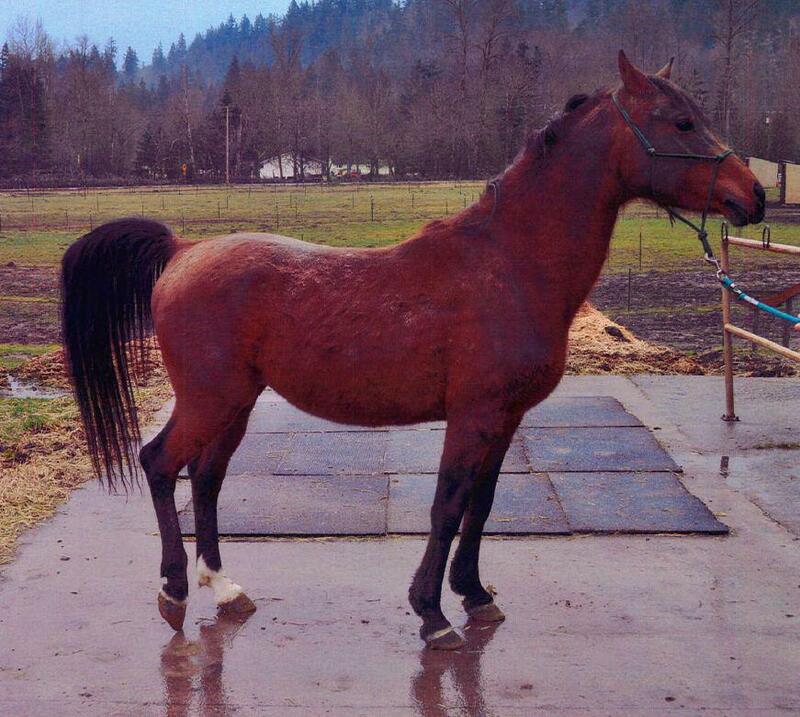 He was signed over to SAFE along with four other Arabs from that seizure in Feb 2012. 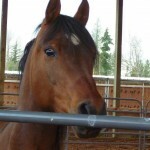 Upon meeting Oscar, we were extremely worried about what we had just committed to by taking him. 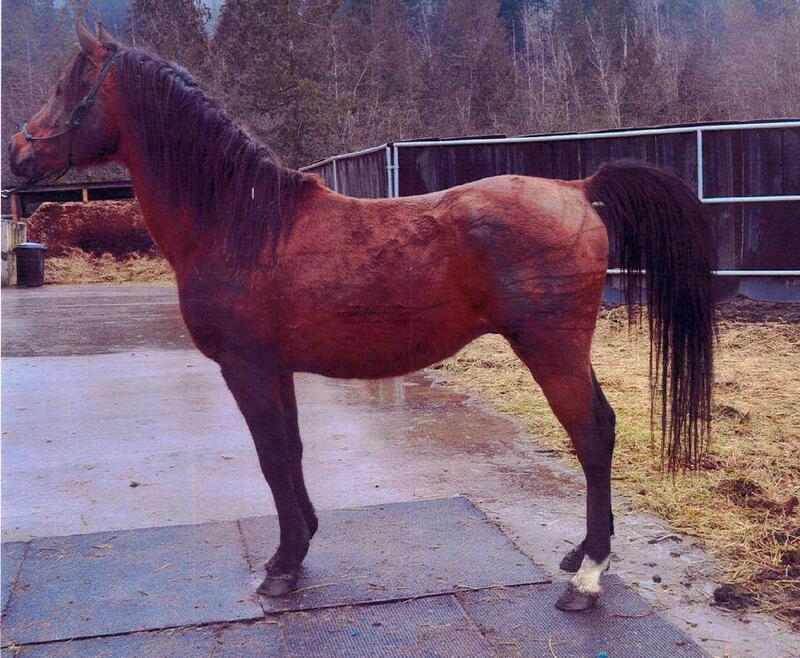 He was a 15 year old breeding stallion with minimal handling due to neglect, and he was about as wild and unruly as you might expect a horse with his background to be. To our surprise and delight, Oscar’s rehabilitation went splendidly. 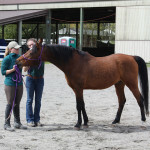 Gelding him was the first step, then basic socialization by Dr Hannah at NWESC followed while he recovered from surgery. 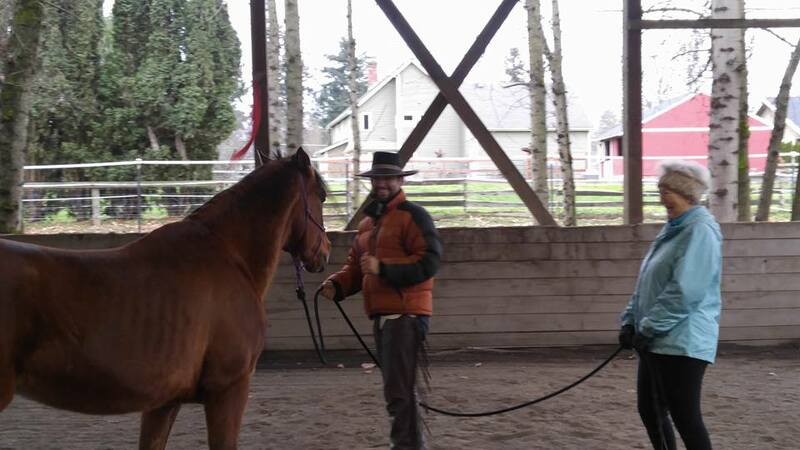 Once he was fully healed, we sent him into training with Andrea Lucianna, where he learned to coexist peacefully with other horses (thanks to Faerplay!) 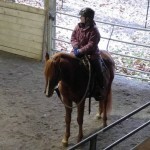 and proceeded to excel in his lessons under saddle. 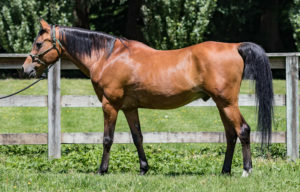 He graduated from Andrea’s training program with high marks, and moved into the barn of trainer Melonie Rainey, who fostered him for several months and donated his ongoing training. 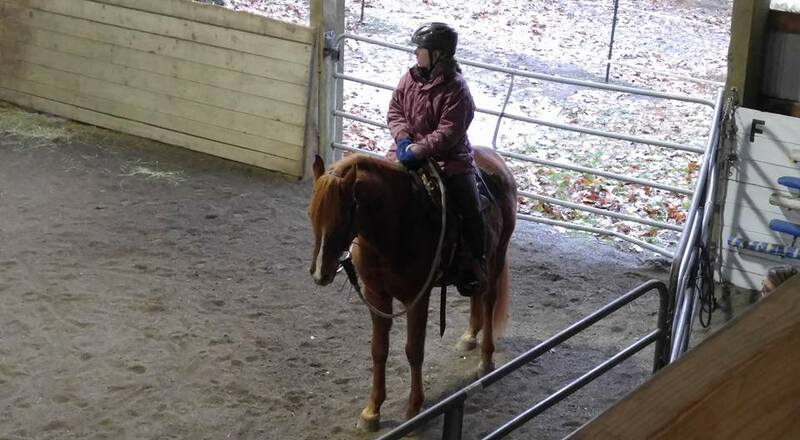 Oscar’s remarkable turnaround continued under Melonie’s guidance, and she found that this former stud horse was gentle enough to be groomed by children and safe enough to be ridden by beginner riders. 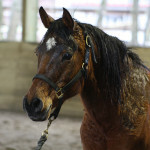 We’ve been enjoying his return to SAFE Harbor. Terry had this to say about him last week: “Oscar loves neck and back scratches! He is such a ham. 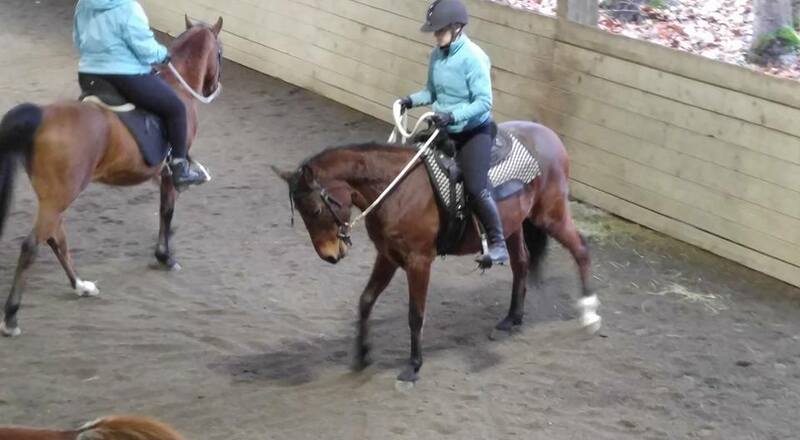 I can’t wait to start riding him next week. 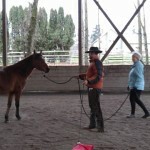 Friday he took the bridle and lunging with side reins no problem. 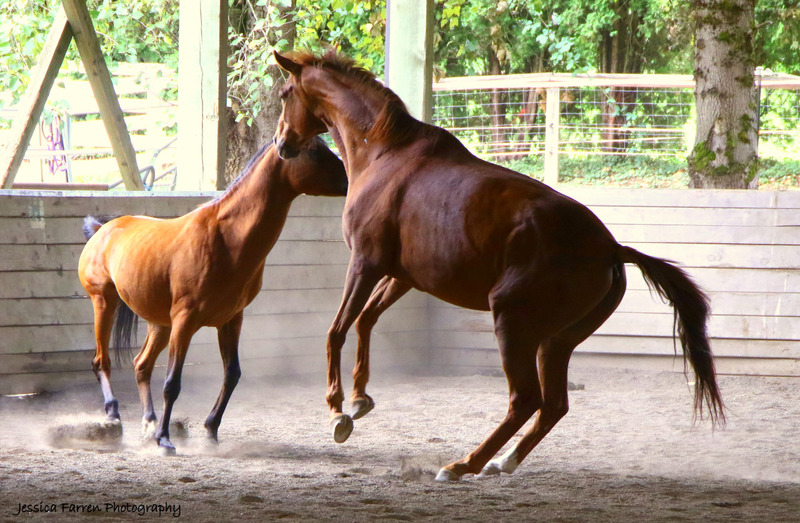 Such a cute mover!” We’ll have more updates for everyone as we continue to work with Oscar, but for now we are feeling very bright about Oscar’s future. Congratulations to Jessicuh on her adoption of Oscar! 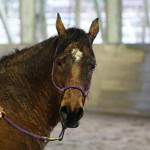 We look forward to updates of Oscar on his journey as the all around family horse. 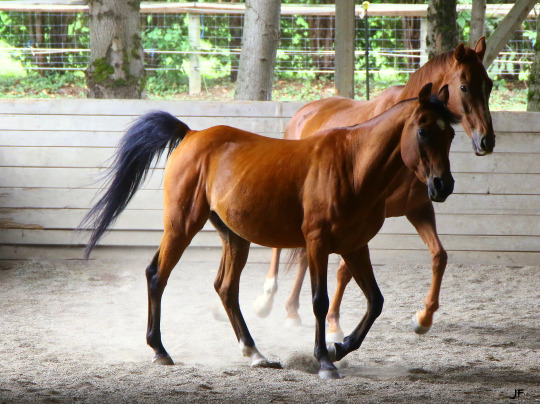 Please join us in wishing happy trails to Oscar and Jessicuh! 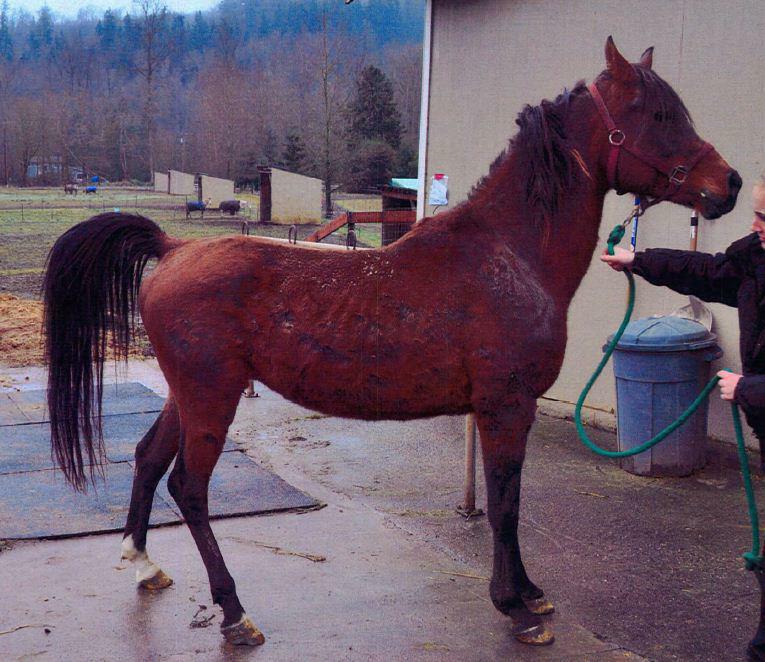 Oscar came to SAFE as a stallion, one of 16 horses seized from a breeding operation by Pierce County Animal Control in Dec 2011. 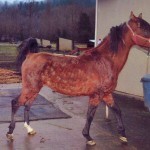 Oscar had been starved and badly neglected. 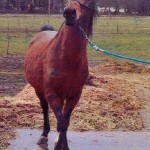 As a breeding stallion, he’d lived a life of isolation and was aggressive and “studdish” towards humans and horses. 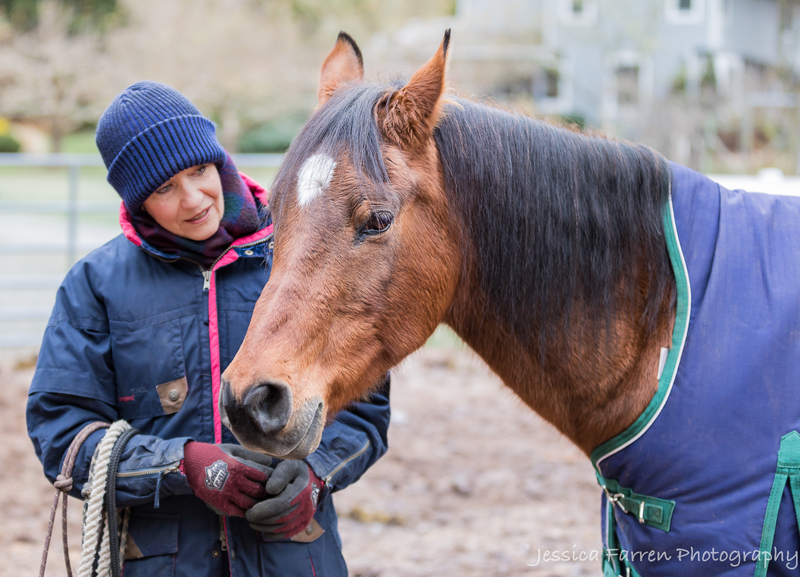 Oscar was gelded immediately after SAFE took possession of him, and for a period of a few weeks, he was only handled by Dr Hannah, who used his post‐surgery exercise sessions to start teaching him ground manners. 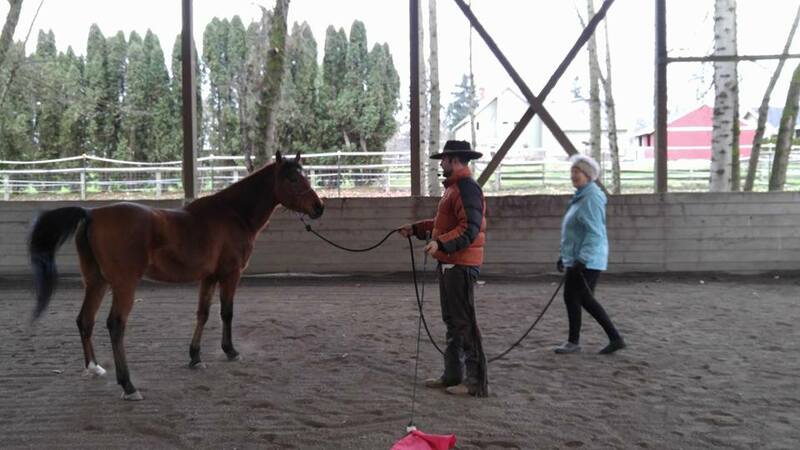 To everyone’s surprise, Oscar responded beautifully to his lessons, and showed a willingness to learn and to connect with his human handlers. 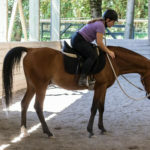 Recovered from his gelding surgery, we sent Oscar on to the next phase of his life: under‐saddle training with Andrea Lucianna at Half Trak Farm. 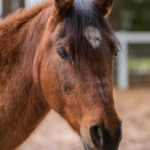 Andrea is an experienced stallion handler, and Oscar was treated very carefully in her care, but apart from some initial calling behavior (“talking” to other horses) he did not display any aggression — no striking, biting, or even ear pinning. 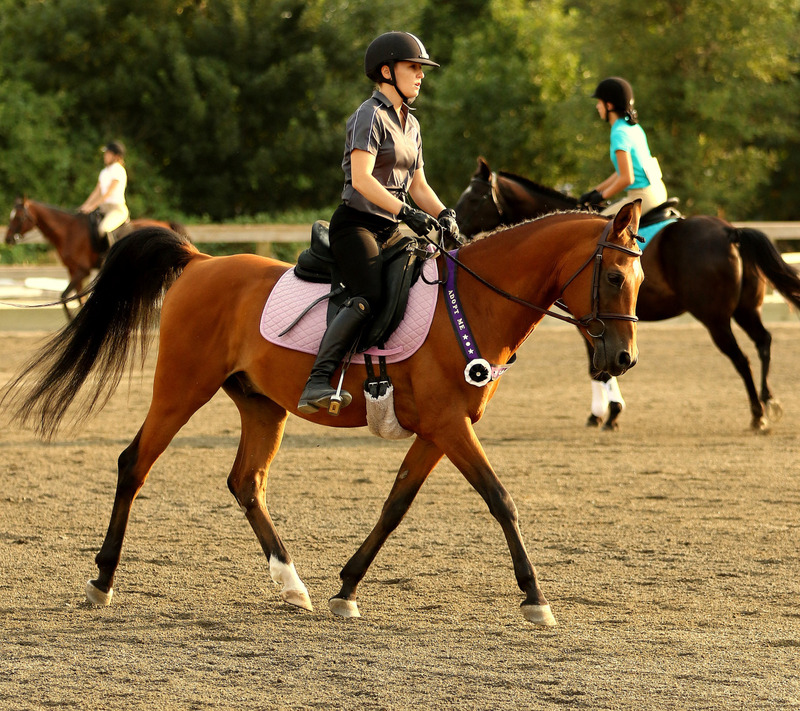 Oscar took to training like a pro, and after 60 days under saddle, he looked like a real dressage prospect! 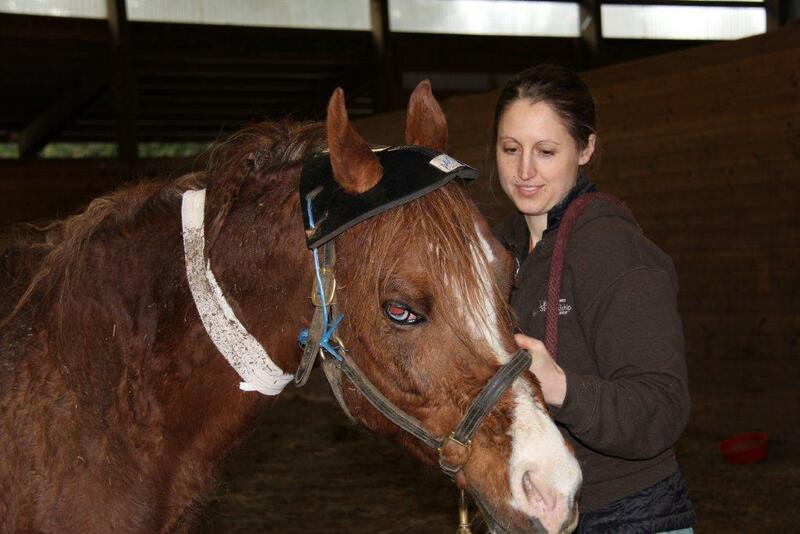 Upon graduating from training, Oscar was sent to White Birch Farm to continue his training with Melonie. 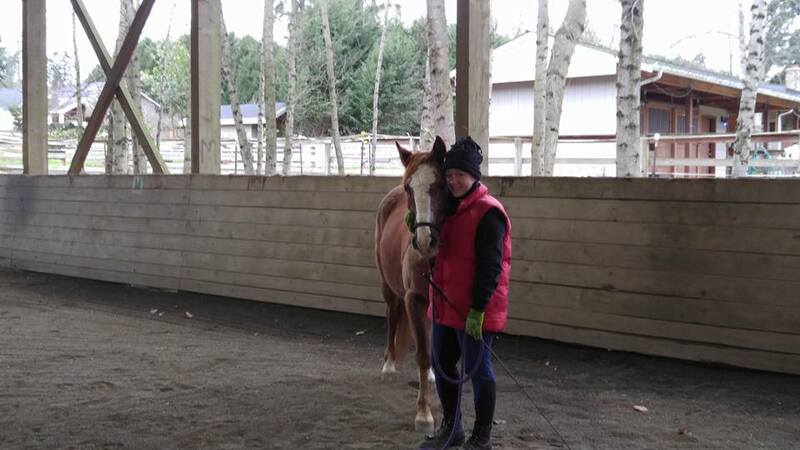 Melonie admits that she was a bit nervous at first, taking on a horse that had only been gelded 90 days previously, but once again, Oscar proved to be a perfect gentleman. 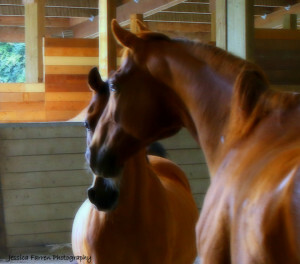 She never saw anything from him as far as talking to other horses, screaming for other horses or any other behavior one might expect with a late gelding. 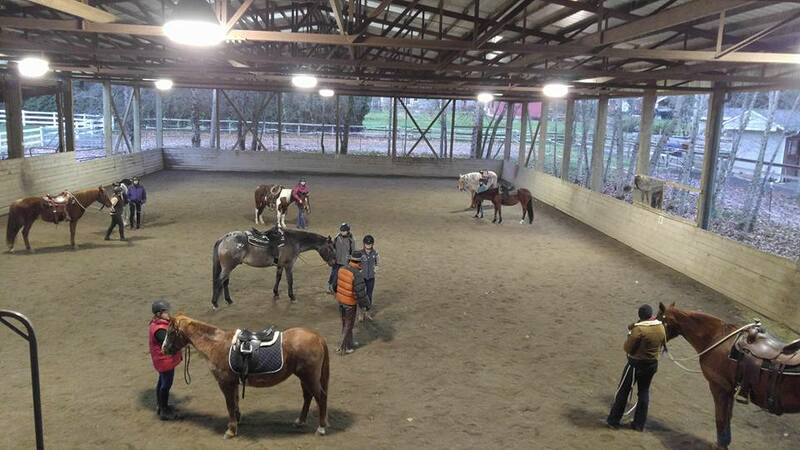 In fact, Oscar was so gentle and well‐behaved that soon he was being used in lessons with beginner riders who’d never even sat on a horse before. 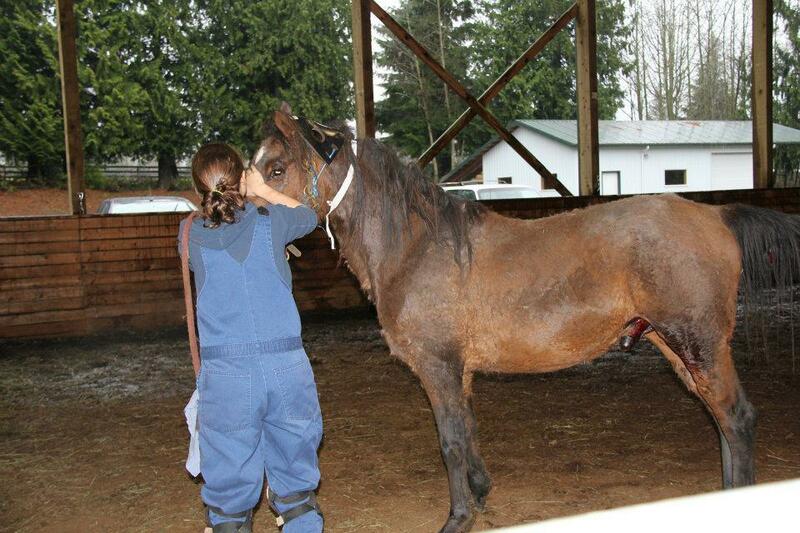 At White Birch Stables, Oscar is such a good boy that Melonie’s neighbor girls can practice grooming on him. 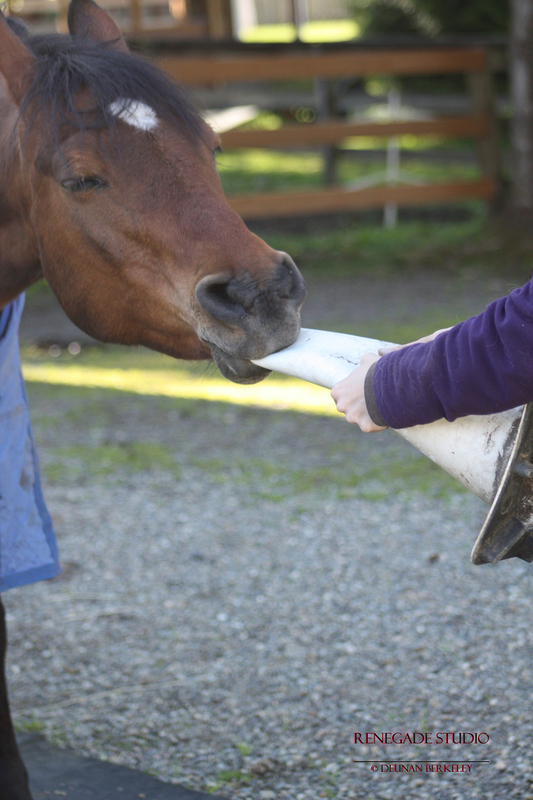 His size helps — he’s little — but he’s got great manners and he’s not at all intimidating. He’s a friendly guy with a great future ahead of him. 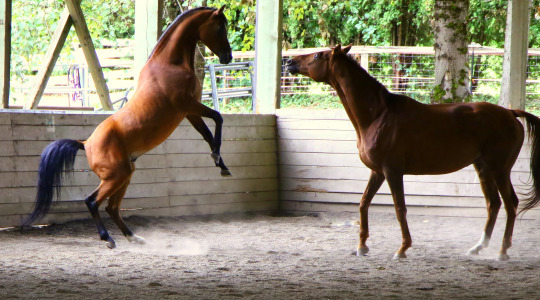 Becoming a gelding opened up a whole new world for Oscar. 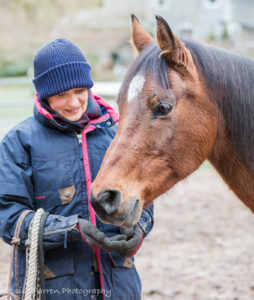 Instead of living in isolation with minimal handling, he now has friends, a job, and positive interactions with the people and horses he lives with. 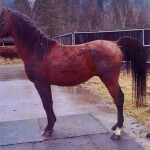 Here at SAFE we truly wish that more stallions could undergo the fairy‐tale life transformation that Oscar has enjoyed. 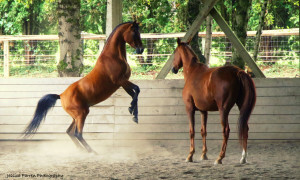 Overbreeding unwanted horses is a serious problem, so putting a stop to backyard breeding is the best reason to geld and to support gelding clinics, for sure. 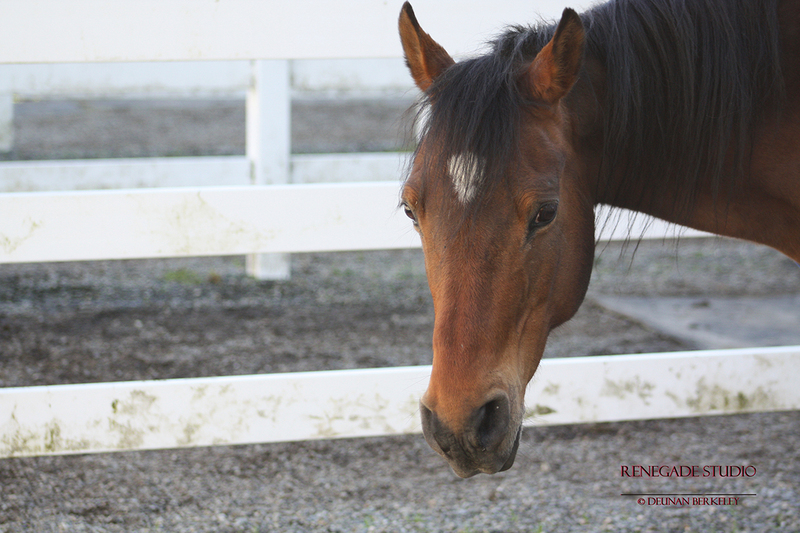 But the life improvements that go along with gelding are a gift to the horses themselves. 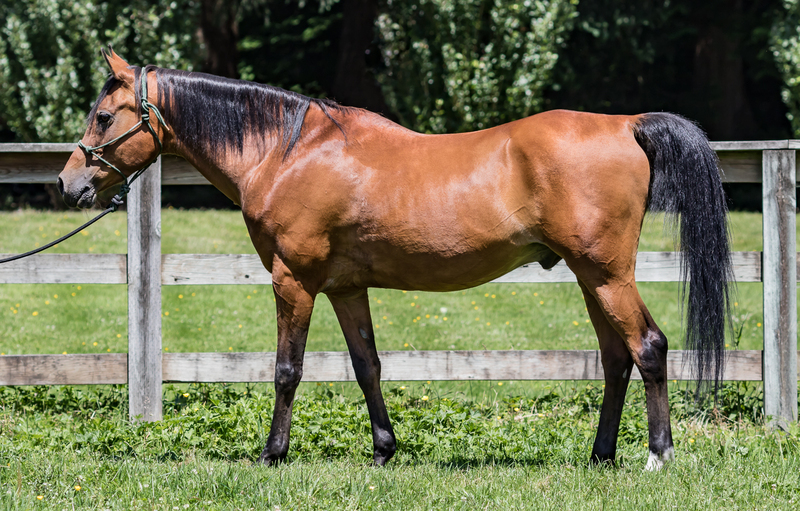 We can’t wait to see what is in store for Oscar, a perfect gelding, a perfect gentleman! Oscar spent a day at SAFE before heading up to training. 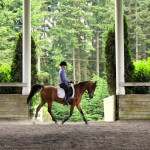 He enjoyed some time playing in the arena, where these gorgeous photos were taken. 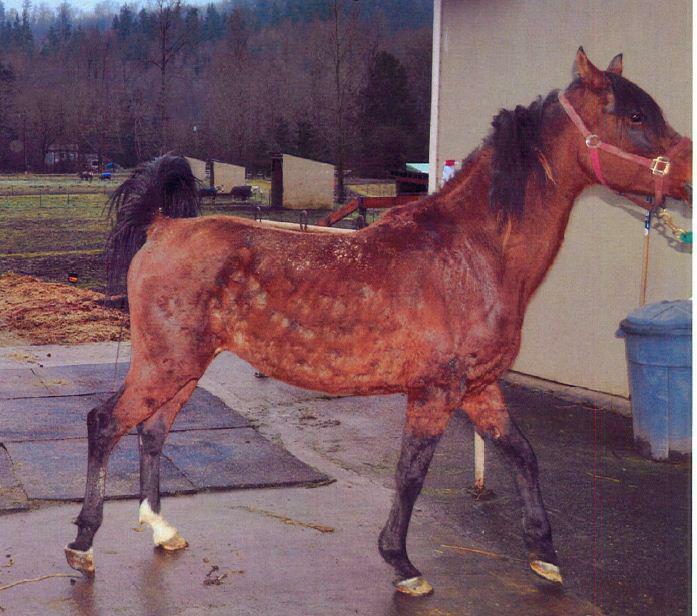 This is what neglect does to horses! Oscar had his teeth done this week and they were some of the worst teeth Dr. Hannah has ever seen. Huge points and ramps that caused ulcerations all along his cheek and had worn down the opposing teeth, in some cases down to the gum line. One broken tooth. He should be feeling much better now! 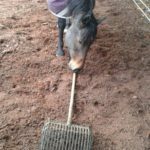 Oscar also had two smaller growths removed, one from his eye and one from a hind leg, that Dr Hannah initially thought were sarcoids. 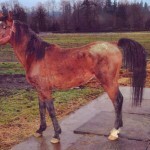 Upon removing the one on the hind leg, however, she felt that it should be sent to pathology, and it came back a melanoma. Dr. Hannah got good margins on the removals and his bloodwork came back good, so hopefully the melanoma will not return or metasticize. 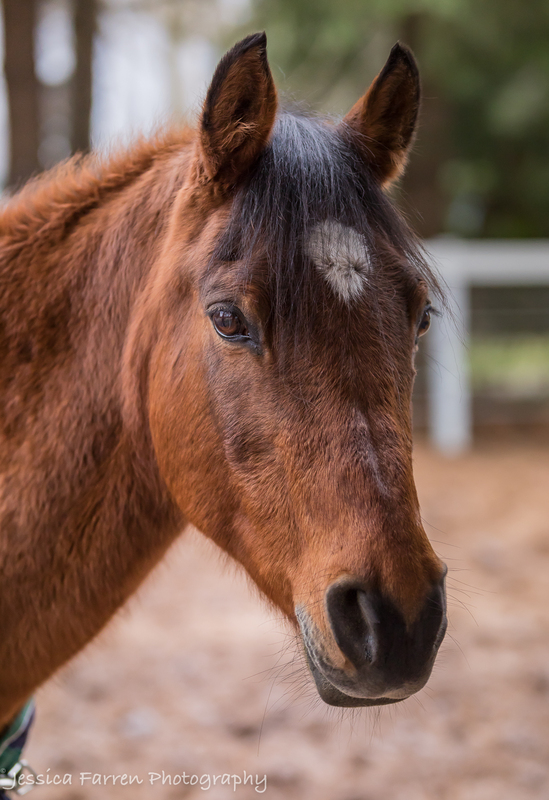 On a very good note, he is now completely healed from his castration, has had all his routine care and in a week will be heading up to training and his next adventure in life! 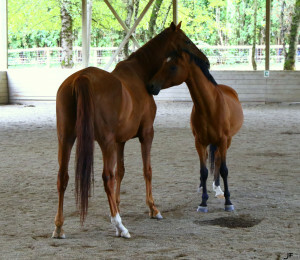 He has done an about‐face in his behavior now that the hormones are gone from his system and we have high hopes he can be a very nice riding horse for someone! 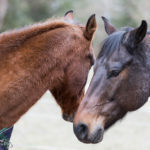 Former stallions Scooter and Oscar are both doing well and Dr Hannah feels like Oscar is ready to get his dental float and have his sarcoids removed, so he has an appointment scheduled for the 19th. 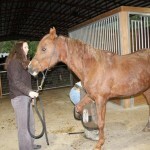 Our plan is to send Oscar into training about a week after his sarcoids are removed. 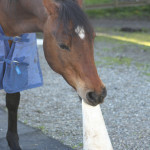 Oscar did well having his feet trimmed today, he had a mare standing behind him and a horse in a stall in front of him. He didn’t “drop” at all which was great. He did give the “stink eye” a couple times, but nothing bad. 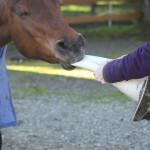 Our farrier, Daphne, has mentioned she is willing to go up north to trim him next time to provide him some consistency while he is learning to respect people working on his feet. Scooter was pretty good but not as good as Oscar. 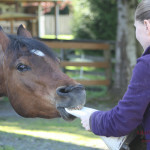 He did drop a few times and had to be backed up and reminded that was not appropriate (especially from our farrier’s perspective) He is not as far along as Oscar in his behavioral changes and will require some more time, hard work, and patience. 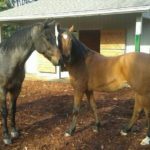 Oscar and Scooter update, updated! 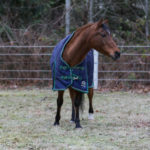 Oscar and Scooter were taken straight to Evergreen Holistic Vet Care on Saturday to await their gelding surgeries. Both stallions have proven to be extremely difficult to handle and their surgeries were bumped up to this week to get them done as soon as possible. 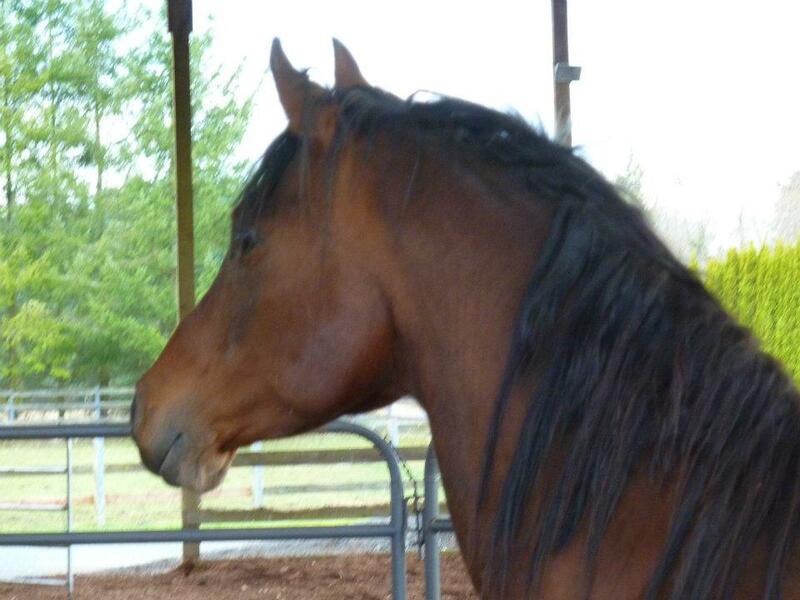 Oscar was castrated today and Scooter will be done later this week. 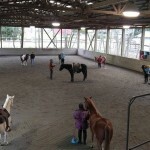 Photos below show Scooter during one of his short, supervised turnout sessions (during which he mostly paces and paws frantically). 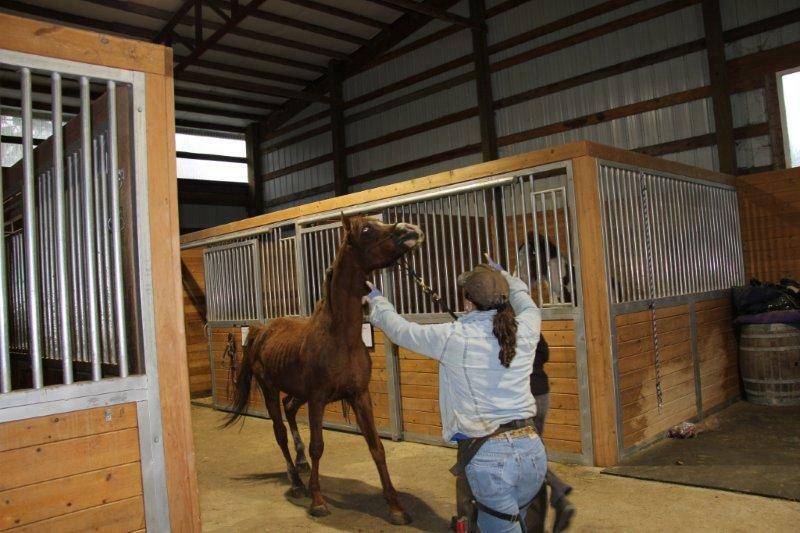 He may not be saying “Please hurry up and make me a gelding”, but we sure are! 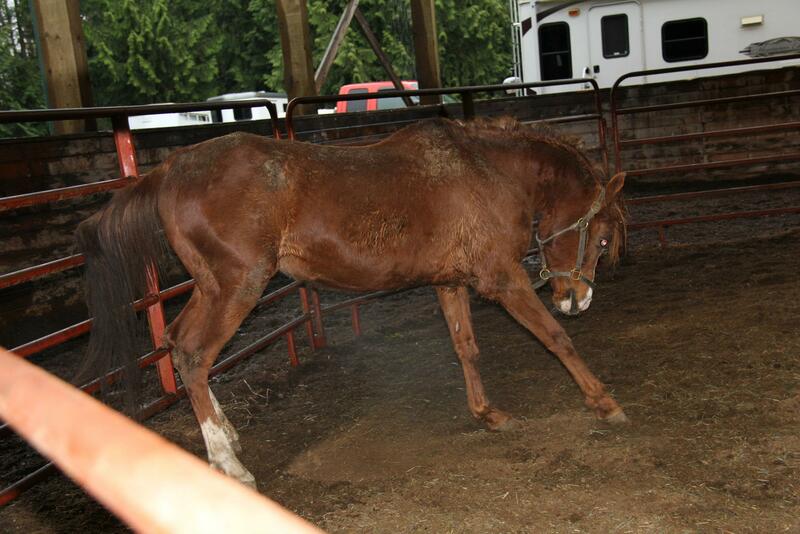 There is NOTHING worse than a unhandled, aged stallion. They are dangerous, and they are miserable. Scooter and Oscar were living in pens that hadn’t been opened in so long they had to cut the fences to get them out. We can only hope that they will settle down after the hormones are out of their system and with consistent handling.